"F-35" redirects here. For other uses, see F35 (disambiguation). The Lockheed Martin F-35 Lightning II is a family of single-seat, single-engine, all-weather stealth multirole fighters. The fifth-generation combat aircraft is designed to perform ground-attack and air-superiority missions. It has three main models: the F-35A conventional takeoff and landing (CTOL) variant, the F-35B short take-off and vertical-landing (STOVL) variant, and the F-35C carrier-based catapult-assisted take-off but arrested recovery (CATOBAR) variant. The F-35 descends from the Lockheed Martin X-35, the winning design of the Joint Strike Fighter (JSF) program. It is built by Lockheed Martin and many subcontractors, including Northrop Grumman, Pratt & Whitney, and BAE Systems. As the largest and most expensive military program ever, the F-35 became the subject of much scrutiny and criticism in the U.S. and in other countries. 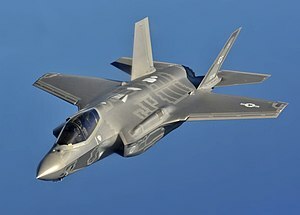 In 2013 and 2014, critics argued that the plane was "plagued with design flaws", with many blaming the procurement process in which Lockheed was allowed "to design, test, and produce the F-35 all at the same time," instead of identifying and fixing "defects before firing up its production line". By 2014, the program was "$163 billion over budget [and] seven years behind schedule". Critics also contend that the program's high sunk costs and political momentum make it "too big to kill". The F-35 first flew on 15 December 2006. In July 2015, the United States Marines declared its first squadron of F-35B fighters ready for deployment. However, the DOD-based durability testing indicated the service life of early-production F-35B aircraft is well under the expected 8,000 flight hours, and may be as low as 2,100 flight hours. Lot 9 and later aircraft include design changes but service life testing has yet to occur. The U.S. Air Force declared its first squadron of F-35As ready for deployment in August 2016. The U.S. Navy declared its first F-35Cs ready in February 2019. In 2018, the F-35 made its combat debut with the Israeli Air Force. F-35 development started in 1992 with the origins of the Joint Strike Fighter (JSF) program and is to culminate in full production in 2018. The X-35 first flew on 24 October 2000 and the F-35A on 15 December 2006. The F-35 was developed to replace most US fighter jets with variants of one design common to all branches of the military. It was developed in co-operation with a number of foreign partners, and unlike the F-22 Raptor, intended to be available for export. Three variants were designed: the F-35A (CTOL), the F-35B (STOVL), and the F-35C (CATOBAR). Despite being intended to share most of their parts to reduce costs and improve maintenance logistics, by 2017, the design commonality was only 20%. The program received considerable criticism for cost overruns during development and for the total projected cost of the program over the lifetime of the jets. By 2017, the program was expected over its lifetime (until 2070) to cost $406.5 billion for acquisition of the jets and $1.1 trillion for operations and maintenance. A number of design deficiencies were alleged, such as carrying a small internal payload, inferior performance to the aircraft being replaced, particularly the F-16, and the lack of safety in relying on a single engine, and flaws were noted such as vulnerability of the fuel tank to fire and the propensity for transonic roll-off (wing drop). The possible obsolescence of stealth technology was also criticized. The single-engined F-35 closely resembles the larger twin-engined Lockheed Martin F-22 Raptor, drawing design elements from its sibling. The exhaust duct design was inspired by the General Dynamics Model 200, proposed for a 1972 supersonic VTOL fighter requirement for the Sea Control Ship. Although several experimental designs have been developed since the 1960s, such as the unsuccessful Rockwell XFV-12, the F-35B is to be the first operational supersonic STOVL stealth fighter. The Autonomic Logistics Global Sustainment, Autonomic Logistics Information System (ALIS), and Computerized maintenance management system to help ensure the aircraft can remain operational with minimal maintenance manpower The Pentagon has moved to open up the competitive bidding by other companies. This was after Lockheed Martin stated that instead of costing 20% less than the F-16 per flight hour, the F-35 would actually cost 12% more. Though the ALGS is intended to reduce maintenance costs, the company disagrees with including the cost of this system in the aircraft ownership calculations. The USMC has implemented a workaround for a cyber vulnerability in the system. The ALIS system currently requires a shipping-container load of servers to run, but Lockheed is working on a more portable version to support the Marines' expeditionary operations. Structural composites in the F-35 are 35% of the airframe weight (up from 25% in the F-22). The majority of these are bismaleimide and composite epoxy materials. The F-35 will be the first mass-produced aircraft to include structural nanocomposites, namely carbon nanotube-reinforced epoxy. Experience of the F-22's problems with corrosion led to the F-35 using a gap filler that causes less galvanic corrosion to the airframe's skin, designed with fewer gaps requiring filler and implementing better drainage. The relatively short 35-foot wingspan of the A and B variants is set by the F-35B's requirement to fit inside the Navy's current amphibious assault ship parking area and elevators; the F-35C's longer wing is considered to be more fuel efficient. The Pratt & Whitney F135 powers the F-35. An alternative engine, the General Electric/Rolls-Royce F136, was being developed until it was cancelled by its manufacturers in December 2011 for lack of funding from the Pentagon. The F135 and F136 engines are not designed to supercruise. However, the F-35 can briefly fly at Mach 1.2 for 150 miles without the use of an afterburner. The F135 is the second (radar) stealthy afterburning jet engine. Like the Pratt & Whitney F119 from which it was derived, the F135 has suffered afterburner pressure pulsations, or 'screech' at low altitude and high speed. The F-35 has a maximum speed of over Mach 1.6. With a maximum takeoff weight of 60,000 lb (27,000 kg),[a] the Lightning II is considerably heavier than the lightweight fighters it replaces. The STOVL F-35B is outfitted with the Rolls-Royce LiftSystem, designed by Lockheed Martin and developed by Rolls-Royce. This system more resembles the German VJ 101D/E than the preceding STOVL Harrier Jump Jet and the Rolls-Royce Pegasus engine. The Lift System is composed of a lift fan, drive shaft, two roll posts and a "Three Bearing Swivel Module" (3BSM). The 3BSM is a thrust vectoring nozzle which allows the main engine exhaust to be deflected downward at the tail of the aircraft. The lift fan is near the front of the aircraft and provides a counterbalancing thrust using two counter-rotating blisks. It is powered by the engine's low-pressure (LP) turbine via a drive shaft and gearbox. Roll control during slow flight is achieved by diverting unheated engine bypass air through wing-mounted thrust nozzles called Roll Posts. The F-35A is armed with a GAU-22/A, a four-barrel version of the 25 mm GAU-12 Equalizer cannon. The cannon is mounted internally with 182 rounds for the F-35A or in an external pod with 220 rounds for the F-35B and F-35C; the gun pod has stealth features. The software that enables operational firing of the cannon is expected to be installed by 2018. The F-35 has external hardpoints to carry missiles, bombs, and drop tanks at the expense of increased radar cross-section, and thus reduced stealth. These include four underwing pylons that can carry the AIM-120 AMRAAM BVR AAM, AGM-158 Joint Air to Surface Stand-off Missile (JASSM) cruise missile, and guided bombs; and two near-wingtip pylons for the AIM-9X Sidewinder and AIM-132 ASRAAM short-range air-to-air missiles (AAM). The F-35 has two internal weapons bays with a total of four weapons stations. Two of these can carry air-to-surface missiles or bombs up to 2,000 lb (910 kg) each in the A and C models, or air-to-surface missiles or bombs up to 1,000 lb (450 kg) each in the B model; the other two stations are for smaller weapons such as air-to-air missiles. The weapon bays can carry AIM-120 AMRAAM, AIM-132 ASRAAM, the Joint Direct Attack Munition (JDAM), Paveway series of bombs, the Joint Standoff Weapon (JSOW), Brimstone anti-tank missiles, and cluster munitions (Wind Corrected Munitions Dispenser). An air-to-air missile load of eight AIM-120s and two AIM-9s is possible using internal and external weapons stations; a configuration of six 2,000 lb (910 kg) bombs, two AIM-120s and two AIM-9s can also be arranged. The Terma A/S multi-mission pod (MMP) could be used for different equipment and purposes, such as electronic warfare, aerial reconnaissance, or rear-facing tactical radar. The British Ministry of Defence plan to fire the Select Precision Effects at Range (SPEAR) Capability 3 missile from the internal bays of the F-35B, with four missiles per bay. Lockheed Martin states that the weapons load can be configured as all-air-to-ground or all-air-to-air, and has suggested that a Block 5 version will carry three weapons per bay instead of two, replacing the heavy bomb with two smaller weapons such as AIM-120 AMRAAM air-to-air missiles. Upgrades are to allow each weapons bay to carry four GBU-39 Small Diameter Bombs (SDB) for A and C models, or three in F-35B. Another option is four GBU-53/B Small Diameter Bomb IIs in each bay on all F-35 variants. The F-35A has been outfitted with four SDB II bombs and an AMRAAM missile to test adequate bay door clearance, as well as the C-model, but the STOVL F-35B will not be able to carry the required load of four SDB IIs in each weapons bay upon reaching IOC because of weight and dimension constraints; F-35B bay changes are to be incorporated to increase SDB II loadout around 2022 in line with the Block 4 weapons suite. The Meteor air-to-air missile may be adapted for the F-35, a modified Meteor with smaller tailfins for the F-35 was revealed in September 2010; plans call for the carriage of four Meteors internally. The United Kingdom planned to use up to four AIM-132 ASRAAM missiles internally, later plans call for the carriage of two internal and two external ASRAAMs. The external ASRAAMs are planned to be carried on "stealthy" pylons; the missile allows attacks to slightly beyond visual range without employing radar. Norway and Australia are funding an adaptation of the Naval Strike Missile (NSM) for the F-35. Under the designation Joint Strike Missile (JSM), it is to be the only cruise missile to fit the F-35's internal bays; according to studies two JSMs can be carried internally with an additional four externally. The F-35 is expected to take on the Wild Weasel mission, though there are no planned anti-radiation missiles for internal carriage. In September 2016, Orbital ATK unveiled its extended-range AARGM-ER incorporating a redesigned control section and 11.5 in (290 mm)-diameter rocket motor for twice the range for internal carriage on the F-35. The B61 nuclear bomb was initially scheduled for deployment in 2017; as of 2012 it was expected to be in the early 2020s, and in 2014 Congress moved to cut funding for the needed weapons integration work. Norton A. Schwartz agreed with the move and said that "F-35 investment dollars should realign to the long-range strike bomber". NATO partners who are buying the F-35 but cannot afford to make them dual-capable want the USAF to fund the conversions to allow their Lightning IIs to carry thermonuclear weapons. The USAF is trying to convince NATO partners who can afford the conversions to contribute to funding for those that cannot. The F-35 Block 4B will be able to carry two B61 nuclear bombs internally by 2024. According to reports in 2002, solid-state lasers were being developed as optional weapons for the F-35. Lockheed is studying integrating a fiber laser onto the aircraft that uses spectral beam combining to channel energy from a stack of individual laser modules into a single, high-power beam, which can be scaled up or down for various levels of effects. Adding a laser would give the F-35 the ability to essentially burn missiles and other aircraft out of the sky. The F-35 is also one of the target platforms for the High Speed Strike Weapon if hypersonic missile development is successful. The US Air Force plans to use the F-35A to primarily take up the close air support (CAS) mission in contested environments. Amid criticism that the aircraft is not well suited for the role compared to a dedicated attack platform, Air Force chief of staff Mark Welsh is putting focus on weapons for the F-35 to employ on CAS sorties including guided rockets, fragmentation rockets that would shatter into individual projectiles before impact, and lighter, smaller ammunition in higher capacity gun pods. Fragmentary rocket warheads would have greater effects than cannon shells fired from a gun because a single rocket would create a "thousand-round burst", delivering more projectiles than a strafing run could. Other weapons could take advantage of the aircraft's helmet-mounted cueing system to aim rather than needing to point the nose at a target. Institute for the Study of War's Christopher Harmer has questioned the use of such an expensive aircraft for CAS. The F-35 has a lower radar cross-section than the preceding generation of fighters, thanks to its shape and the use of fiber-mat and other stealthy, radar-absorbent materials. It is also designed to have lower infrared and visual signatures. Among the design elements that reduce radar signature are chines that generate vortex lift in the same fashion as the SR-71 Blackbird, instead of the leading edge extensions of the F-16 and F/A-18. The small bumps just forward of the engine air intakes — part of the diverterless supersonic inlet, a simpler, lighter means to ensure high-quality airflow to the engine over a wide range of conditions — also eliminate radar reflections between the diverter and the aircraft's skin and reduce the amount of radar energy that reaches the engine fans to be reflected. Such reflection is also reduced by the Y-duct-type air intake ramps, which run parallel to the fuselage and not directly into the engine fans. Special care is taken during production to match the "boilerplate". F-35A front profile in flight. The doors are opened to expose the aerial refueling inlet valve. The F-35's radar-absorbent materials are designed to be more durable and require less maintenance than those on the F-117, B-2, and F-22. At some frequencies, the F-35 compares favorably to the F-22 in stealth, according to General Mike Hostage, commander of the Air Combat Command. Low-frequency radars can spot stealthy aircraft because of Rayleigh scattering, but such radars are also conspicuous, susceptible to clutter, and have low precision. The F-35's anti-radar design is primarily focused on the higher-frequency X-band used by missile lock and targeting sensors, rendering them ineffective beyond close ranges. Ground crews use Repair Verification Radar test sets to ensure that a given repair has not increased its radar signature, which is not a concern for non-stealth aircraft. Like the Fighter Teen Series (F-14, F-15, F-16, F/A-18), the F-35 can carry large external fuel tanks, but flies most missions without them to keep its radar signature low. In 2008, Air Force officials said the F-35 would be about twice as loud as the McDonnell Douglas F-15 Eagle at takeoff and up to four times as loud during landing. This led residents near two potential F-35 bases — Luke Air Force Base, Arizona, and Eglin Air Force Base, Florida — to request environmental impact studies about the jet's noise. The following year, the city of Valparaiso, Florida, adjacent to Eglin AFB, threatened to sue over the impending F-35 arrival; this lawsuit was settled in March 2010. In 2009, testing reportedly revealed the F-35 to be "only about as noisy as an F-16 fitted with a Pratt & Whitney F100-PW-200 engine" and quieter than the F-22 and F/A-18E/F. An acoustics study by Lockheed Martin and the Air Force found F-35 noise to be comparable to the F-22 and F/A-18E/F. A 2012 USAF environmental impact study found that replacing F-16s with F-35s at Tucson International Airport would subject more than 21 times as many residents to extreme noise levels. Meanwhile, the U.S. Navy began to develop ways to protect sailors' ears from the F-35's "thundering 152 decibels". But in October 2014, the Joint Strike Fighter program office said that the F-35B's take-off noise was only two decibels higher than a Super Hornet, a virtually indistinguishable difference to the human ear, and is even 10 decibels quieter when flying formations or landing. A 20- by 8-inch (50 by 20 cm) glass cockpit touchscreen dubbed a panoramic cockpit display. An Adacel cockpit speech-recognition system, a first for an operational US fixed-wing aircraft, although similar systems have been used on the AV-8B Harrier II and trialed in the F-16 VISTA and other aircraft. A right-hand HOTAS side stick controller. A Martin-Baker US16E ejection seat. Launched by a twin-catapult system housed in side rails, the seat is widely used in fighter jets, but can endanger lightweight pilots wearing the F-35's heavier-than-usual helmet. An oxygen-generating system derived from the one on the F-22, which has been involved in multiple hypoxia incidents. Unlike the F-22, the flight profile of the F-35 is similar to other fighters that routinely use such systems. On 9 June 2017, the 55 F-35s at Luke Air Force Base were grounded after five pilots complained of hypoxia-like symptoms over a five-week span. Symptoms ranged from dizziness to tingling in their extremities. The suspension was initially expected to last one day, but was extended to give investigators more time. Flying was resumed on 20 June, with no direct cause having been found. It lacks a head up display, making it the first frontline fighter in decades without one. The F-35's sensor and communications suite has situational awareness, command and control and network-centric warfare capabilities. The main sensor on board is the AN/APG-81 active electronically scanned array-radar, designed by Northrop Grumman Electronic Systems. It is augmented by the nose-mounted Electro-Optical Targeting System (EOTS), it provides the capabilities of an externally mounted Sniper Advanced Targeting Pod with a reduced radar cross-section. The AN/ASQ-239 (Barracuda) system is an improved version of the F-22's AN/ALR-94 electronic warfare suite, providing sensor fusion of radio frequency and infrared tracking functions, advanced radar warning receiver including geolocation targeting of threats, multispectral image countermeasures for self-defense against missiles, situational awareness and electronic surveillance, employing 10 radio frequency antennae embedded into the edges of the wing and tail. In September 2015, Lockheed unveiled the "Advanced EOTS" that offers short-wave infrared, high-definition television, infrared marker, and superior image detector resolution capabilities. Offered for the Block 4 configuration, it fits into the same area as the baseline EOTS with minimal changes while preserving stealth features. 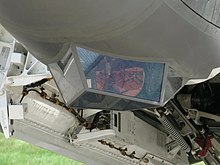 Six additional passive infrared sensors are distributed over the aircraft as part of Northrop Grumman's electro-optical AN/AAQ-37 Distributed Aperture System (DAS), which acts as a missile warning system, reports missile launch locations, detects and tracks approaching aircraft spherically around the F-35, and replaces traditional night vision devices. All DAS functions are performed simultaneously, in every direction, at all times. The electronic warfare systems are designed by BAE Systems and include Northrop Grumman components. Functions such as the Electro-Optical Targeting System and the electronic warfare system are not usually integrated on fighters. A DAS sensor mounted in a test platform detected a two-stage ballistic missile launch 1,300 kilometers away. The communications, navigation and identification (CNI) suite is designed by Northrop Grumman and includes the Multifunction Advanced Data Link (MADL), as one of a half dozen different physical links. The F-35 will be the first fighter with sensor fusion that combines radio frequency and IR tracking for continuous all-direction target detection and identification which is shared via MADL to other platforms without compromising low observability. Link 16 is also included for communication with legacy systems. The F-35 has been designed with synergy between sensors as a specific requirement, the aircraft's "senses" being expected to provide a more cohesive picture of the battlespace around it and be available for use in any possible way and combination with one another; for example, the AN/APG-81 multi-mode radar also acts as a part of the electronic warfare system. The Program Executive Officer (PEO) General Bogdan has described the sensor fusion software as one of the most difficult parts of the program. Much of the F-35's software is written in C and C++ because of programmer availability; Ada83 code also is reused from the F-22. The Integrity DO-178B real-time operating system (RTOS) from Green Hills Software runs on COTS Freescale PowerPC processors. The final Block 3 software is planned to have 8.6 million lines of code. In 2010, Pentagon officials discovered that additional software may be needed. General Norton Schwartz has said that the software is the biggest factor that might delay the USAF's initial operational capability. In 2011, Michael Gilmore, Director of Operational Test & Evaluation, wrote that, "the F-35 mission systems software development and test is tending towards familiar historical patterns of extended development, discovery in flight test, and deferrals to later increments". The electronic warfare and electro-optical systems are intended to detect and scan aircraft, allowing engagement or evasion of a hostile aircraft prior to being detected. The CATbird avionics testbed aircraft has proved capable of detecting and jamming radars, including the F-22's AN/APG-77. The F-35 was previously considered a platform for the Next Generation Jammer; attention shifted to using unmanned aircraft in this capacity instead. Several subsystems use Xilinx FPGAs; these COTS components enable supply refreshes from the commercial sector and fleet software upgrades for the software-defined radio systems. Lockheed Martin's Dave Scott stated that sensor fusion boosts engine thrust and oil efficiency, increasing the aircraft's range. Air Force official Ellen M. Pawlikowski has proposed using the F-35 to control and coordinate multiple unmanned combat aerial vehicles (UCAVs). Using its sensors and communications equipment, a single F-35 could orchestrate an attack made by up to 20 armed UCAVs. The F-35 does not need to be physically pointing at its target for weapons to be successful. Sensors can track and target a nearby aircraft from any orientation, provide the information to the pilot through their helmet (and therefore visible no matter which way the pilot is looking), and provide the seeker-head of a missile with sufficient information. Recent missile types provide a much greater ability to pursue a target regardless of the launch orientation, called "High Off-Boresight" capability. Sensors use combined radio frequency and infra red (SAIRST) to continually track nearby aircraft while the pilot's helmet-mounted display system (HMDS) displays and selects targets; the helmet system replaces the display-suite-mounted head-up display used in earlier fighters. Each helmet costs $400,000. Problems with the Vision Systems International helmet-mounted display led Lockheed Martin-Elbit Systems to issue a draft specification for alternative proposals in early 2011, to be based around the Anvis-9 night vision goggles. BAE Systems was selected to provide the alternative system in late 2011. The BAE Systems alternative helmet was to include all the features of the VSI system. However, adopting the alternative helmet would have required a cockpit redesign, but in 2013 development on the alternative helmet was halted because of progress on the baseline helmet. The F-35 Joint Program Office has stated that the aircraft has received good reviews from pilots and maintainers, suggesting it is performing better than its predecessors did at a similar stage of development, and that the stealth type has proved relatively stable from a maintenance standpoint. This reported improvement is attributed to better maintenance training, as F-35 maintainers have received far more extensive instruction at this early stage of the program than on the F-22 Raptor. The F-35's stealth coatings are much easier to work with than those used on the Raptor. Cure times for coating repairs are lower and many of the fasteners and access panels are not coated, further reducing the workload for maintenance crews. Some of the F-35's radar-absorbent materials are baked into the jet's composite skin, which means its stealthy signature is not easily degraded. It is still harder to maintain (because of the need to preserve its stealth characteristics) than fourth-generation aircraft. The first F-35A (designated AA-1) was rolled out in Fort Worth, Texas, on 19 February 2006. In September 2006, the first engine run of the F135 in an airframe took place. On 15 December 2006, the F-35A completed its maiden flight. A modified Boeing 737–300, the Lockheed Martin CATBird has been used as an avionics test-bed for the F-35 program, including a duplication of the cockpit. By June 2009, many of the initial flight test targets had been accomplished but the program was behind schedule. During 2008, a Pentagon Joint Estimate Team (JET) estimated that the program was two years behind the public schedule, a revised estimate in 2009 predicted a 30-month delay. Delays reduced planned production numbers by 122 aircraft through 2015 to provide an additional $2.8 billion for development; internal memos suggested that the official timeline would be extended by 13 months. The success of the JET led Ashton Carter calling for more such teams for other poorly performing projects. A U.S. Navy F-35C makes the aircraft's first arrested landing aboard the carrier USS Nimitz (CVN 68) off the coast of San Diego. The F-35C's maiden flight took place on 7 June 2010, at NAS Fort Worth JRB. A total of 11 U.S. Air Force F-35s arrived in fiscal year 2011. On 9 March 2011, all F-35s were grounded after a dual generator failure and oil leak in flight; the cause of the incident was discovered to have been the result of faulty maintenance. In 2012, Navy Commander Erik Etz of the F-35 program office commented that rigorous testing of the F-35's sensors had taken place during exercise Northern Edge 2011, and had served as a significant risk-reduction step. On 6 October 2012, the F-35A dropped its first bomb, followed three days later by an AIM-120 AMRAAM. On 28 November 2012, an F-35C performed a total of eleven weapon releases, including a GBU-31 JDAM and GBU-12 Paveway from its weapons bay in the first weapons released for the F-35C. On 5 June 2013, an F-35A at the Point Mugu Sea Test Range completed the first in-flight missile launch of an AIM-120 C5 AAVI (AMRAAM Air Vehicle Instrumented). It was launched from the internal weapons bay. On 16 November 2012, the U.S. Marines received the first F-35B at MCAS Yuma, and the VMFA(AW)-121 unit is to be redesignated from a Boeing F/A-18 Hornet unit to an F-35B squadron. A February 2013 Time article revealed that Marine pilots are not allowed to perform a vertical landing—the maneuver is deemed too dangerous, and it is reserved only for Lockheed test pilots. On 21 March 2013, the USMC performed its first hover and vertical landing with an F-35B outside of a testing environment. On 10 May 2013, the F-35B completed its first vertical takeoff test. On 3 August 2013, the 500th vertical landing of an F-35 took place. On 18 January 2013, the F-35B was grounded after the failure of a fueldraulic line in the propulsion system on 16 January. The problem was traced to an "improperly crimped" fluid line manufactured by Stratoflex. The Pentagon cleared all 25 F-35B aircraft to resume flight tests on 12 February 2013. On 22 February 2013, the U.S. Department of Defense grounded the entire fleet of 51 F-35s after the discovery of a cracked turbine blade in a U.S. Air Force F-35A at Edwards Air Force Base. On 28 February 2013, the grounding was lifted after an investigation concluded that the cracks in that particular engine resulted from stressful testing, including excessive heat for a prolonged period during flight, and did not reflect a fleetwide problem. The F-35C Lightning II carrier variant Joint Strike Fighter conducted its first carrier-based night flight operations aboard an aircraft carrier off the coast of San Diego on 13 November 2014. On 5 June 2015, the U.S. Air Education and Training Command Accident Investigation Board reported that catastrophic engine failure had led to the destruction of an Air Force F-35A assigned to the 58th Fighter Squadron at Eglin Air Force Base, Florida, on 23 June 2014. The third-stage forward integral arm of a rotor had fractured and broke free during the takeoff roll. Pieces cut through the engine's fan case, engine bay, internal fuel tank and hydraulic and fuel lines before leaving through the aircraft's upper fuselage. Leaked fuel and hydraulic fluid ignited the fire, which destroyed the rear two-thirds of the aircraft. The destruction of the airframe resulted in the cancelation of the F-35's international debut at the 2014 Farnborough Airshow in England, the temporary grounding of the F-35 fleet and ongoing restrictions in the flight envelope. On 19 June 2015 the RAF successfully launched two 500 lb Paveway IV precision-guided bombs, making the test the first time non-US munitions were deployed by the aircraft. The US Marines declared the aircraft had met initial operational capability on 31 July 2015, despite shortcomings in night operations, communications, software and weapons carriage capabilities. However, J. Michael Gilmore, director of the Pentagon’s Operational Test and Evaluation Office, criticized the operational trials as not valid. In an internal memo, Gilmore concluded "the exercise was so flawed that it 'was not an operational test … in either a formal or informal sense of the term.' Furthermore, the test 'did not—and could not—demonstrate' that the version of the F-35 that was evaluated 'is ready for real-world operational deployments, given the way the event was structured.'" On 11 April 2016 the Joint Program Office confirmed that the Royal Netherlands Air Force (RNLAF) had cleared its KDC-10 aerial tanker to refuel the F-35, paving the way for the fighter’s international public debut at the RNLAF’s Open Dagen (Open Days) at Leeuwarden on 10–11 June 2016. The testing required the fighter to refuel in daylight, dusk and night, with 30,000 lb. of fuel being transferred during the tests. In 2011, the Director of Operational Test and Evaluation warned that the USAF's plan to start unmonitored flight training "risks the occurrence of a serious mishap". The leaders of the United States Senate Committee on Armed Services called on Defense Secretary Leon Panetta to reconsider the plan. Despite the objections, expanded trial flights began in September 2012. On 21 August 2012, J. Michael Gilmore wrote that he would not approve the Operational Test and Evaluation master plan until his concerns about electronic warfare testing, budget, and concurrency were addressed. On 7 September 2012, the Pentagon failed to approve a comprehensive operational testing plan for the F-35. Instead, on 10 September 2012, the USAF began an operational utility evaluation (OUE) of the F-35A entire system, including logistical support and maintenance, maintenance training, pilot training, and pilot execution. By 1 October, the OUE was reported as "proceeding smoothly". Pilots started on simulators, then began flying on 26 October. The OUE was completed on 14 November with the 24th flight, the four pilots involved having completed six flights each. On 9 December 2010, a media report stated that the "USMC will base 216 F-35Bs on the East Coast and 184 of them on the West Coast, documents showed". 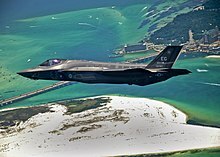 This report continued: "Cherry Point will get 128 jets to form eight squadrons; Beaufort will have three squadrons and a pilot training center using 88 aircraft; Miramar will form six operational squadrons with 96 jets and 88 F-35s will go to Yuma for five operational squadrons with an additional test and evaluation unit". In February 2014, the U.S. Air Force announced that the first Air National Guard unit to fly the new F-35 Lightning II will be the 158th Fighter Wing of the Vermont Air National Guard based at the Burlington Air Guard Station. The 158th currently flies F-16 Fighting Falcons, which are nearing the end of their useful service lives. Burlington Air Guard Station is expected to receive 18 F-35As, replacing the 18 F-16 Fighting Falcons currently assigned. The F-35A is expected to arrive in 2020. 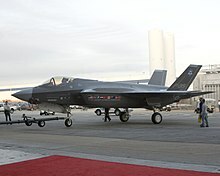 On 11 March 2014, the first F-35A Lightning II assigned to Luke Air Force Base arrived at the base. 16 F-35s are to be delivered to the base by the end of 2014, with 144 Lightning IIs to be stationed there, arriving over the course of the next decade. On 8 January 2015, the Royal Air Force base RAF Lakenheath in the UK was chosen as the first base in Europe to station two American F-35 squadrons, following an announcement by the Pentagon. 48 F-35s, making up 2 squadrons, will add to the 48th Fighter Wing's already existing F-15C and F-15E Strike Eagle jets. On 22 May 2018, Israeli Air Force chief Amikam Norkin said that the Israeli Air Force had employed the F-35 in two attacks on two battle fronts, the first time any F-35 was used in a combat operation by any country. The air force chief said the plane had been flown "all over the Middle East", and showed conference participants photos of an Israeli F-35 flying over Beirut in a daylight flight. On 27 September 2018, a United States Marines Corps F-35B attacked a Taliban target in Afghanistan, the first U.S. combat employment. The F-35B took off from the USS Essex amphibious assault ship in the Arabian Sea. While the United States is the primary customer and financial backer, along with the United Kingdom, Italy, the Netherlands, Canada, Turkey, Australia, Norway, and Denmark have agreed to contribute US$4.375 billion towards development costs. Total development costs are estimated at more than US$40 billion. The purchase of an estimated 2,400 aircraft is expected to cost an additional US$200 billion. The initial plan was that the nine major partner nations would acquire over 3,100 F-35s through 2035. Sales to partner nations are made through the Pentagon's Foreign Military Sales program. There are three levels of international participation. The levels generally reflect financial stake in the program, the amount of technology transfer and subcontracts open for bid by national companies, and the order in which countries can obtain production aircraft. The United Kingdom is the sole "Level 1" partner, contributing US$2.5 billion, which was about 10% of the planned development costs under the 1995 Memorandum of Understanding that brought the UK into the project. Level 2 partners are Italy, which is contributing US$1 billion; and the Netherlands, US$800 million. Level 3 partners are Turkey, US$195 million; Canada, US$160 million; Australia, US$144 million; Norway, US$122 million and Denmark, US$110 million. Israel and Singapore have joined as Security Cooperative Participants (SCP). In particular, there are signs that the Republic of Singapore Air Force (RSAF) is interested, as the force has indicated that it is seriously evaluating a potential purchase and the defense minister has indicated that an F-16 replacement will be announced soon. Japan announced on 20 December 2011 its intent to purchase 42 F-35s with deliveries beginning in 2016 to replace the F-4 Phantom II; Japan seeks 38 F-35s, to be assembled domestically. By 2012, many changes had occurred in the order book. Italy became the first country to announce a reduction of its overall fleet procurement, cutting its buy from 131 to 90 aircraft. Other nations reduced initial purchases or delayed orders while still intending to purchase the same final numbers. The U.S. canceled the initial purchase of 13 F-35s and postponed orders for another 179. The United Kingdom cut its initial order and delayed a decision on future orders. Australia decided to buy the Boeing F/A-18E/F Super Hornet as an interim measure. Turkey also cut its initial order of four aircraft to two, but confirmed plans to purchase 100 F-35As. Turkey will buy four F-35s to be delivered in 2015 and 2016, while the order may be increased from 100 to 120 aircraft. These changes resulted in increased procurement prices, and increased the likelihood of further cuts. On 3 April 2012, the Auditor General of Canada Michael Ferguson published a report outlining problems with Canada's procurement of the jet, including misinformation over the final cost. According to the Auditor General, the government knowingly understated the final price of the 65 jets by $10 billion. Canada's Conservative government had stated it would not reduce its order, and anticipated a $75–80 million unit cost; the procurement was termed a "scandal" and "fiasco" by the media and faced a full review to determine any Canadian F-35 purchase. On 13 December 2012, in a scathing editorial published by CBC News, journalist Brian Stewart termed the F-35 project a "global wrecking ball" for its runaway costs and lack of affordability for many participating nations. The Canadian government ultimately decided not to proceed with sole-sourced purchase of the fighter and commenced a competition to choose a different aircraft. The F-35A is the conventional takeoff and landing (CTOL) variant intended for the U.S. Air Force and other air forces. It is the smallest, lightest F-35 version and is the only variant equipped with an internal cannon, the GAU-22/A. This 25 mm cannon is a development of the GAU-12 carried by the USMC's AV-8B Harrier II. It is designed for increased effectiveness against ground targets compared to the 20 mm M61 Vulcan cannon carried by other USAF fighters. The A variant is primarily intended to replace the USAF's F-16 Fighting Falcon. At one point it was also intended to replace the A-10 Thunderbolt II starting in 2028. The F-35A can be outfitted to receive fuel via either of the two main aerial refueling methods; this was a consideration in the Canadian procurement and a deciding factor for the Japanese purchase. On 18 December 2013, the Netherlands became the second partner country to operate the F-35A, when Maj. Laurens J.W. Vijge of the Royal Netherlands Air Force took off from Eglin Air Force Base. The F-35As for the Royal Norwegian Air Force will have drag chute installed. Norway will be the first country to adopt the drag chute pod. On 2 August 2016, the U.S. Air Force declared the F-35A basic combat ready. The 34th Fighter Squadron located at Hill Air Force Base, Utah, has at least 12 combat-ready jets capable of global deployment. The F-35A is scheduled to be fully combat ready in 2017 with its 3F software upgrade. Air Combat Command will initially deploy F-35A to Red Flag exercises and as a "theater security package" to Europe and the Asia-Pacific. It will probably not be fighting the Islamic State in the Middle East earlier than 2017. On 13 July 2017, UK Minister of State For Defence Frederick Curzon confirmed that the UK will purchase a minimum 138 aircraft and a decision will shortly be forthcoming as whether there will be a 'mix' of F-35A and 'B' versions required for 'synergy' and 'inter-service operability' between the RAF and Royal Navy. The F-35B is the short takeoff and vertical landing (STOVL) variant of the aircraft. Similar in size to the A variant, the B sacrifices about a third of the A variant's fuel volume to accommodate the vertical flight system. Vertical takeoffs and landings are riskier because of threats such as foreign object damage. Whereas the F-35A is stressed to 9 g, the F-35B's stress goal is 7 g. As of 2014[update], the F-35B is limited to 4.5 g and 400 knots. The next software upgrade includes weapons, and allows 5.5 g and Mach 1.2, with a final target of 7 g and Mach 1.6. The first test flight of the F-35B was conducted on 11 June 2008. Another milestone, the first successful ski-jump launch was carried out by BAE test pilot Peter Wilson on 24 June 2015. Unlike other variants, the F-35B has no landing hook. The "STOVL/HOOK" control instead engages conversion between normal and vertical flight. Jet thrust is sent directly downwards during vertical flight. The variant's three-bearing swivel nozzle that directs the full thrust of the engine is moved by a "fueldraulic" actuator using pressurized fuel as the working fluid. Although the Australian Canberra-class landing helicopter dock ships were not originally planned to operate fixed-wing aircraft, in May 2014, the Minister for Defence David Johnston stated in media interviews that the government was considering acquiring F-35B fighters for Canberras, and Prime Minister Tony Abbott instructed 2015 Defence White Paper planners to consider the option of embarking F-35B squadrons aboard the two ships. Supporters of the idea stated that providing fixed-wing support to amphibious operations would maximize aircraft capability, and the presence of a ski-jump ramp, inherited from the original design, meant that the vessels were better suited to STOVL operations than equivalent ships with flat flight decks. Opponents to the idea countered that embarking enough F-35Bs to be effective required abandoning the ships' amphibious capability and would make the pseudo-carriers more valuable targets, modifications would be required to make the flight deck capable of handling vertical-landing thrust and to increase fuel and ordnance capacity for sustained operations, and that the F-35B project itself has been the most expensive and most problematic of the Joint Strike Fighter variants. In July 2015, Australia ended consideration of buying the F-35B for its two largest assault ships, as the ship modifications were projected to cost more than AUS$5 billion (US$4.4 billion). The plan was opposed by the Royal Australian Air Force, as an F-35B order could have diminished the number of F-35As purchased. In 2011, the Marina Militare was preparing Grottaglie Air Station for F-35B operations; they are to receive 22 aircraft between 2014 and 2021, with the aircraft carrier Cavour set to be modified to operate them by 2016. Three F-35Bs are escorted by a pair of RAF Typhoon FGR4s en route to the 2016 Royal International Air Tattoo. Known simply as the Lightning in British service, the United Kingdom's Royal Air Force and Royal Navy plan to introduce the F-35B as a replacement for the Harrier GR9, which was retired in 2010, and Tornado GR4, which was retired in 2019. The F-35 is intended to be the United Kingdom's primary strike attack aircraft for the next three decades. One of the Royal Navy requirements for the F-35B design was a Shipborne Rolling and Vertical Landing (SRVL) mode to increase maximum landing weight to bring back unused ordnance by using wing lift during landing. In July 2013, Chief of the Air Staff, Air Chief Marshal Sir Stephen Dalton announced that No. 617 (The Dambusters) Squadron would be the first operational Royal Air Force squadron to receive the F-35. The second operational squadron will be the Fleet Air Arm's 809 Naval Air Squadron in April 2023. In June 2013, the Royal Air Force had received three aircraft of the 48 on order, all of which are based at Eglin Air Force Base. The F-35 will be based at Royal Air Force Marham and become operational in 2018. In June 2015, the F-35B undertook its first launches from a ski-jump, when one of the UK's aircraft took off using a ramp constructed at NAS Patuxent River. When required to operate from the sea, the Royal Air Force and Royal Navy will operate the F-35B from ships fitted with ski-jumps, as will the Italian Navy. The British version of the F-35B is not intended to receive the Brimstone 2 missile. On 5 July 2017, it was announced the second RAF squadron to be based in the UK would be No. 207 Squadron, which will reform on 1 July 2019 as the Lightning Operational Conversion Unit. No. 617 Squadron was reformed on 18 April 2018 during a ceremony in Washington DC, becoming the first RAF front-line squadron to operate the Lightning. The Dambusters received their first four F-35Bs on 6 June, flying from MCAS Beaufort to RAF Marham. Receiving a further five Lightnings on 3 August, No. 617 Squadron and the F-35 fleet were declared 'combat ready' on 10 January 2019. No. 617 Squadron will undergo its first deployment to RAF Akrotiri, Cyprus, sometime in 2019 before embarking on HMS Queen Elizabeth in Autumn 2019. The U.S. Marine Corps plans to purchase 340 F-35B and 80 F-35C models to replace current inventories of both the F/A-18 Hornet (A, B, C and D-models), and the AV-8B Harrier II, in the fighter and attack roles. The Marines plan to use the F-35B from "unimproved surfaces at austere bases" but with "special, high-temperature concrete designed to handle the heat". The USMC declared initial operational capability with about 50 F-35s running interim block 2B software on 31 July 2015. The USAF had considered replacing the A-10 with the F-35B, but will not do so because of the F-35B's inability to generate enough sorties. On 6 January 2011, Gates said that the 2012 budget would call for a two-year pause in F-35B production during which the aircraft faced redesign, or cancellation if unsuccessful. In 2011, Lockheed Martin executive vice president Tom Burbage and former Pentagon director of operational testing Tom Christie stated that most program delays were due to the F-35B, which forced massive redesigns of other versions. Lockheed Martin Vice President Steve O’Bryan has said that most F-35B landings will be conventional to reduce stress on vertical lift components. These conventional mode takeoffs and landings cause an "unacceptable wear rate" to the aircraft's "poorly designed" tires. USMC Lt. Gen. Robert Schmidle has said that the vertical lift components would only be used "a small percentage of the time" to transfer the aircraft from carriers to land bases. On 3 October 2011, the F-35B began its initial sea-trials by performing a vertical landing on the deck of the amphibious assault ship USS Wasp, to continue in 2015. Probation status was reportedly ended by Defense Secretary Leon Panetta in January 2012 based on progress made. A heat-resistant anti-skid material called Thermion is being tested on Wasp, also useful against the V-22 exhaust. Commandant of the U.S. Marine Corps, General James Amos has said that, in spite of increasing costs and schedule delays, there is no plan B to the F-35B. The F-35B is larger than the aircraft it replaces, which required USS America to be designed without well deck capabilities. In 2011, the USMC and USN signed an agreement by which the USMC will purchase 340 F-35B and 80 F-35C fighters, while the USN will purchase 260 F-35Cs. The five squadrons of USMC F-35Cs will be assigned to Navy carriers; F-35Bs will be used on amphibious ships and ashore. The U.S. Marine Corps plans to disperse its F-35Bs among forward deployed bases to enhance survivability while remaining close to a battlespace, similar to RAF Harrier deployment late in the Cold War, which relied on the use of off-base locations that offered short runways, shelter, and concealment. Known as distributed STOVL operations (DSO), Marine F-35Bs would sustain operations from temporary bases in allied territory within the range of hostile ballistic and cruise missiles, but be moved between temporary locations inside the enemy's 24- to 48-hour targeting cycle. This strategy accounts for the F-35B's short range, the shortest of the three variants, with mobile forward arming and refueling points (M-Farps) accommodating KC-130 and MV-22 Osprey aircraft to rearm and refuel the jets, as well as littoral areas for sea links of mobile distribution sites on land. M-Farps could be based on small airfields, multi-lane roads, or damaged main bases, while F-35Bs would return to U.S. Navy ships, rear-area U.S. Air Force bases, or friendly carriers for scheduled maintenance; metal planking would be needed to protect unprepared roads from the F-35B's engine exhaust, which would be moved between sites by helicopters, and the Marines are studying lighter and more heat-resistant products. The U.S. Navy intends to buy 260 F-35Cs to replace the F/A-18A, B, C, and D Hornets and complement the F/A-18E and F/A-18F Super Hornet fleet. The U.S. Marine Corps will also operate five squadrons of F-35Cs that will deploy aboard aircraft carriers and augment US Navy carrier air wings under the two services' long-standing Tactical Aviation Integration (TAI) initiative. On 27 June 2007, the F-35C completed its Air System Critical Design Review (CDR), allowing the production of the first two functional prototypes. The C variant was expected to be available beginning in 2014. The first F-35C was rolled out on 29 July 2009. The U.S. Marine Corps will also purchase 80 F-35Cs, enough for five squadrons, for use with navy carrier air wings in a joint service agreement signed on 14 March 2011. A recent 2014 document stated that the USMC will also have 4 squadrons of F-35Cs with 10 aircraft per squadron for the Marine Corps' contribution to U.S. Navy carrier air wings. On 6 November 2010, the first F-35C arrived at Naval Air Station Patuxent River. In 2011, the F-35Cs were grounded for six days after a software bug was found that could have prevented the control surfaces from being used during flight. On 27 July 2011, the F-35C test aircraft CF-3 completed its first steam catapult launch during a test flight at Naval Air Engineering Station Lakehurst; the TC-13 Mod 2 test steam catapult, representative of current fleet technology, was used. In addition to catapult launches at varying power levels, a three-week test plan included dual-aircraft jet blast deflector testing and catapult launches using a degraded catapult configuration to measure the effects of steam ingestion on the aircraft. On 13 August 2011, the F-35 successfully completed jet blast deflector (JBD) testing at Lakehurst. F-35C test aircraft CF-1 along with an F/A-18E tested a combined JBD cooling panel configuration. The tests measured temperature, pressure, sound level, velocity, and other environmental data; the JBD model will enable the operation of all carrier aircraft, including the F-35C. Further carrier suitability testing continued in preparation for initial ship trials in 2013. On 18 November 2011, the U.S. Navy used its new Electromagnetic Aircraft Launch System (EMALS) to launch an F-35C into the air for the first time. On 22 June 2013, Strike Fighter Squadron VFA-101 received the Navy's first F-35C at Eglin Air Force Base, Florida. The fighter's F135 engine exceeds the weight capacity of traditional underway replenishment systems and generates more heat than previous engines. The U.S. Navy may use the F-35C as part of its UCLASS effort to operate a carrier-based unmanned aerial vehicle. Though it has been suggested that the UCLASS could carry air-to-air weapons, an unmanned aircraft lacks situational awareness and is more vulnerable to electronic countermeasures than manned aircraft, and autonomy for deploying lethal weapons is not under development. With the F-35C as the center of a network of naval systems, it could feed information to the UCLASS and order it to fire on a certain target. Large numbers of F-35Cs operating in contested environments can generate a clear picture of the battlespace, and share it with unmanned assets that can be directed to attack. VFA-147 was selected to be the first operational squadron to transition to the F-35C in January 2018. Operational testing was to continue aboard USS Abraham Lincoln at the beginning of 2018. The carrier is the first to be modernized to operate the F-35C. Initial operating capability is expected between mid-2018 and early 2019, with the first deployment is scheduled aboard USS Carl Vinson in 2020. The F-35C will equip two of the four strike fighter squadrons in a carrier air wing. The US Navy declared initial operational capability for the F-35C on 28 February 2019. Israeli Air Force F-35I Adir. It was operational with the IAF in 2018 and performed the first airstrikes with the aircraft type. The F-35I Adir (Hebrew: אדיר, meaning "Awesome", or "Mighty One") is an F-35A with Israeli modifications. A senior Israel Air Force official said, "The aircraft will be designated F-35I, as there will be unique Israeli features installed in them". The U.S. initially refused to allow such modifications, then agreed to let Israel integrate its own electronic warfare systems, such as sensors and countermeasures. The main computer will have a plug-and-play feature to allow add-on Israeli electronics to be used; proposed systems include an external jamming pod, and new Israeli air-to-air missiles and guided bombs in the internal weapon bays. Israel Aerospace Industries (IAI) has considered helping to develop a proposed two-seat F-35. An IAI executive said, "There is a known demand for two seats not only from Israel but from other air forces". IAI plans to produce conformal fuel tanks. A senior IAF official said that elements of the F-35's stealth may be overcome in 5 to 10 years, while the aircraft will be in service for 30 to 40 years, which is why Israel insisted on installing their own electronic warfare systems: "The basic F-35 design is OK. We can make do with adding integrated software". Israel is interested in purchasing up to 75 F-35s. On 12 December 2016, Israel began receiving its first F-35Is of the 50 it plans to purchase for integration and testing. Israel is to be the second nation with an operational F-35 squadron, after the U.S. The first nine F-35s became operational (at initial operating capacity) in the Israeli Air Force in December 2017. On 22 May 2018, the commander of the Israel's Air Force, Major General Amikam Norkin, said that Israel became the first country to use the F-35 in combat. That combat was during clashes with Iran in Syria, but IDF officials also said that F-35 has been "flying all over the Middle East", and had also carried out airstrikes on another Middle Eastern battlefront. The Canadian CF-35 is a proposed variant that would differ from the F-35A through the addition of a drogue parachute and may include an F-35B/C-style refueling probe. In 2012, it was revealed that the CF-35 would employ the same boom refueling system as the F-35A. One alternative proposal would have been the adoption of the F-35C for its probe refueling and lower landing speed; however, the Parliamentary Budget Officer's report cited the F-35C's limited performance and payload as being too high a price to pay. Following the 2015 Federal Election the Liberal Party, whose campaign had included a pledge to cancel the F-35 procurement, won a majority in the House of Commons. The new government stated it would run a competition for an aircraft to replace the existing CF-18 Hornet. Israeli Air Force – 14 currently delivered and operational (F-35I), from 50 ordered, and 75 planned. Italian Air Force – 9 F-35A operational and 2 more on order with 17 more ordered for delivery up to 2019; up to 60 total planned. Japan Air Self-Defense Force – 12 operational; with a total order of 147, including 42 F-35B variants. 38 are being built by Mitsubishi. Republic of Korea Air Force – 2 delivered out of 60 ordered. Italian Navy – 15 planned of which 1 delivered with 4 on order for delivery by 2019. The F-35 first crashed on 28 September 2018, when a USMC F-35B crashed near Marine Corps Air Station Beaufort, South Carolina, after the pilot ejected safely. All F-35s were grounded until each could be inspected for a faulty engine fuel line, and the line replaced if necessary. On 9 April 2019, a Japan Self-Defense Forces F-35A attached to Misawa Air Base disappeared from radar during a training mission over the Pacific Ocean, when it was about 84 miles (135 km) east of the Aomori Prefecture. The aircraft was confirmed to have crashed after debris from it was found on the water. The pilot's fate is still unknown. The pilot, 41-year old Maj. Akinori Hosomi, was on a routine air combat training mission with three other F-35s. The Major radioed the other three pilot that he was aborting the drill shortly before disappearing. Both the US an Japanese Navy have sent ships and aircraft to search for the missing jet and pilot. In response to the incident Japan has grounded the remaining 12 F-35As but is still committed to purchasing 105 F-35As and 42 F-35Bs. There has been speculation that China or Russia might attempt to salvage the crashed jet, but Defense Minister Takeshi Iwaya has stated there has been no reported activities from either countries. The cause of the crash and its disappearance from radar has baffled investigators as the jet is outfitted with a transponder that will reveal its location on radar. It is reported that the jet did not send a distress signal during the crash nor the pilot mentioned any problems with the aircraft during communication. In addition, the training was not a low-level flight, suggesting that Maj. Akinori Hosomi could have had time to react given his wealth of experience. ^ Story, Courtesy (31 July 2015). "U.S. Marines Corps declares the F-35B operational". marines.mil. Headquarters Marine Corps. Retrieved 31 July 2015. ^ Reed Business Information Limited. "US Marines stick to F-35B dates despite new problems". flightglobal.com. Retrieved 25 May 2015. ^ "F-35B on track for operational readiness despite software challenges". janes.com. Archived from the original on 29 April 2015. Retrieved 25 May 2015. ^ "U.S. Air Force eyes future F-35 engine and arms upgrades". Reuters. 7 April 2015. Retrieved 25 May 2015. ^ "Navy Declares Initial Operational Capability for F-35C Joint Strike Fighter F-35C". ^ "F-35 LIGHTNING II PROGRAM STATUS AND FAST FACTS - April 2019" (PDF). 11 April 2019. ^ "F-35 Lightning II Program Fact Sheet Selected Acquisition Report (SAR) 2015 Cost Data" (PDF). 24 March 2016. ^ a b c "Pentagon and Lockheed Martin Agree To Reduced F-35 Price in New Production Contract" (PDF). jsf.mil/. 28 September 2018. Retrieved 28 September 2018. ^ "F-35 Global Partnerships". lockheedmartin.com. Lockheed Martin. Archived from the original on 2 September 2012. Retrieved 31 October 2012. ^ Dudley, Richard. "Program Partners Confirm Support for F-35 Joint Strike Fighter". Defence Update, 5 March 2012. Retrieved: 18 March 2012. ^ "F-35 chief reaffirms Turkey's status as committed programme partner". Jane's 360. 1 October 2018. ^ "Lockheed's F-35 Has a Turkey Problem". Bloomberg.com. 5 October 2018. ^ a b Ciralsky, Adam. "Will the F-35, the U.S. Military's Flaw-Filled, Years-Overdue Joint Strike Fighter, Ever Actually Fly?". Vanity Fair. Retrieved 29 September 2015. ^ "Fighter plane cost overruns detailed". Politico. Retrieved 29 September 2015. ^ "Flawed F-35 Too Big to Kill as Lockheed Hooks 45 States". Bloomberg.com. 22 February 2013. Retrieved 29 September 2015. ^ Kedmey, Dan (31 July 2015). "New F-35 Fighter Jets Are Ready for Combat". Time. ^ Cameron, Doug (31 July 2015). "Marines Say Costly F-35 Jet Fighter Is Finally Ready". The Wall Street Journal. ^ "FY18 DOD PROGRAMS F-35 Joint Strike Fighter (JSF)" (PDF). dote.osd.mil. 2019. p. 25. ^ Insinna, Valerie (2 August 2016). "Air Force Declares F-35A Ready for Combat". Defense News. Retrieved 7 January 2017 – via defensenews.com. ^ a b Eckstein, Megan (28 February 2019). "Navy Declares Initial Operational Capability for F-35C Joint Strike Fighter". usni.org. USNI News. Retrieved 28 February 2019. ^ Kubovich, Yaniv (22 May 2018). "Israel Launched World's First Air Strike Using F-35 Stealth Fighters, Air Force Chief Says". Haaretz. Retrieved 22 May 2018. ^ a b c d Ahronheim, Anna (22 May 2018). "IAF Commander: Israel First To Use F-35 Jet In Combat". Jerusalem Post. ^ Osborn, Kris (17 December 2013). "Air Force Seeks Jets Beyond C-17 and Even JSF". military.com. Military Advantage. Archived from the original on 25 May 2014. Retrieved 24 May 2014. ^ F-35 Program Information – Non Export Controlled Information Keith P. Knotts, 9 July 2013. ^ Barrett, Paul (10 April 2017). "Danger Zone". Bloomberg Businessweek. pp. 50–55. .
^ "F-35 Program Costs Jump to $406.5 Billion in Latest Estimate". Bloomberg. ^ Amaani, USAF Tech. Sgt. Lyle (3 April 2009). "Air Force takes combat air acquisitions priorities to Hill". af.mil. US Air Force. ^ a b "Capabilities". lockheedmartin.com. Lockheed Martin. Archived from the original on 24 July 2010. ^ "LockMart F-35 FAQ". f35.com. Lockheed Martin. 2011. ^ Trimble, Stephen (4 February 2010). "Lockheed Martin sees F-35A replacing USAF air superiority F-15C/Ds". Flight International. Archived from the original on 15 February 2010. Retrieved 2 March 2010. ^ "Raytheon Selects RACE++ Multicomputers for F-35 Joint Strike Fighter". embeddedstar.com. Archived from the original on 27 October 2015. Retrieved 25 October 2015. ^ "Avionics Magazine :: JSF: Integrated Avionics Par Excellence". aviationtoday.com. Retrieved 25 October 2015. ^ Philips, E. H. "The Electric Jet". Aviation Week & Space Technology, 5 February 2007. ^ Parker, Ian (1 June 2007). "Reducing Risk on the Joint Strike Fighter". Avionics Magazine. Access Intelligence, LLC. Retrieved 8 June 2007 – via aviationtoday.com. ^ "F/A-18E/F Super Hornet". boeing.com. Boeing. ^ Giese, Jack. "F-35 Brings Unique 5th Generation Capabilities". lockheedmartin.com, 23 October 2009. ^ Shalal-Esa, Andrea. "Pentagon seeks competition for sustainment of Lockheed F-35". [dead link] Reuters, 28 September 2012. ^ Sweetman, Bill. "Wrongheaded? Really?" Archived 4 April 2013 at the Wayback Machine Aviation Week, 18 October 2012. ^ Majumdar, Dave. "USMC finds workaround for cyber vulnerability on F-35 logistics system". Flight International, 20 November 2012. ^ Tucker, Patrick (8 January 2015). "The F-35 Has To Phone Texas Before Taking Off". defenseone.com. Defense One. Retrieved 2 July 2015. ^ Trimble, Stephen. "Farnborough: Lockheed encouraged by pace of F-35 testing". Flight International, 12 July 2010. Retrieved 22 July 2010. ^ "USAF works to bridge gap between its sustainment cost estimates and Lockheed's". Flight International. 12 January 2013. Retrieved 24 February 2013. ^ "Pentagon to Use Lithium-Ion Batteries for F-35 Jets Despite Boeing 787 Woes". Dailytech.com. Archived from the original on 17 February 2013. Retrieved 24 February 2013. ^ "Skinning the F-35 fighter". compositesworld.com. Retrieved 24 November 2016. ^ "Contract Awarded To Validate Process For JSF" Archived 14 March 2012 at the Wayback Machine. onlineamd.com, 17 May 2010. Retrieved 22 July 2010. ^ Trimble, Stephen. "Lockheed Martin reveals F-35 to feature nanocomposite structures". Archived 30 May 2011 at the Wayback Machine Flight International, 26 May 2011. ^ Edwards, Jack E. "Defense Management: DOD Needs to Monitor and Assess Corrective Actions Resulting from Its Corrosion Study of the F-35 Joint Strike Fighter". United States Government Accountability Office, Washington, DC, 16 December 2010. ^ Ryberg, Eric S. (26 February 2002). "The Influence of Ship Configuration on the Design of the Joint Strike Fighter" (PDF). Naval Surface Warfare Center Dahlgren Division. p. 5. Retrieved 1 December 2013 – via dtic.mil. ^ "The Ultimate Fighter?". Airspacemag.com. Archived from the original on 16 January 2013. Retrieved 24 February 2013. ^ Clark, Colin (27 January 2011). "AF Worries JSF Costs May Soar". DoD Buzz. ^ Capaccio, Tony. "Lockheed Martin F-35 Operating Costs May Reach $1 Trillion". Archived 29 April 2011 at the Wayback Machine Bloomberg News, 21 April 2011. ^ Tirpak, John A. (8 January 2014). "The Cost of Teamwork". airforcemag.com. Arlington, Virginia: Air Force Association. Archived from the original on 25 May 2014. Retrieved 24 May 2014. ^ Hemmerdinger, Jon (16 December 2013). "Lockheed touts F-35 progress, predicts competitive pricing". flightglobal.com. Photo credits: Lockheed Martin. Archived from the original on 25 May 2014. Retrieved 24 May 2014. ^ Trimble, Stephen. "Rolls-Royce: F136 survival is key for major F-35 engine upgrade". Archived 14 June 2009 at the Wayback Machine Flight International, 11 June 2009. ^ "GE, Rolls Royce Stop Funding F-35 Alt Engine". Defense News, 4 December 2011. ^ "Frequently Asked Questions about JSF". JSF. Retrieved 6 April 2010. ^ Warwick, Graham. "Screech, the F135 and the JSF Engine War". Aviation Week, 17 March 2011. ^ a b c Lockheed Martin. "F-35A Conventional Takeoff and Landing Variant". Archived from the original on 17 March 2011. Retrieved 13 July 2012. ^ Hirschberg, Mike. ""V/STOL Fighter Programs in Germany: 1956–1975", p. 50. International Powered Lift Conference, 1 November 2000. Retrieved 3 October 2012. ^ "How the Harrier hovers" Archived 7 July 2010 at the Wayback Machine. harrier.org. Retrieved 16 November 2010. ^ Zolfagharifard, Ellie. "Rolls-Royce's LiftSystem for the Joint Strike Fighter" The Engineer, 28 March 2011. ^ Kjelgaard, Chris. "From Supersonic to Hover: How the F-35 Flies". Space, 21 December 2007. Retrieved 18 October 2010. ^ Hutchinson, John. "Going Vertical: Developing a STOVL system" Archived 20 July 2015 at the Wayback Machine. ingenia.org.uk. Retrieved 23 November 2009. ^ "Pratt Raises Stakes In JSF Engine Battle". Aviation Week, 27 August 2010. Retrieved 25 November 2010. ^ Director, Operational Test and Evaluation (January 2014). "FY 2013 Annual Report – CVN‑78 Gerald R. Ford Class Nuclear Aircraft Carrier" (PDF). Approved by: Director J. Michael Gilmore. Archived (PDF) from the original on 25 May 2014. Retrieved 24 May 2014. ^ Swedberg, Claire. "Energy-Harvesting Sensors to Monitor Health of Jet Engines". RFID Journal, 31 May 2011. ^ Whitney, Pratt &. "Pratt & Whitney Validates Growth Option for F135 Engine". prnewswire.com. Retrieved 25 November 2017. ^ "F-35 gun system" Archived 6 June 2011 at the Wayback Machine, "GAU-22/A" Archived 17 July 2011 at the Wayback Machine. General Dynamics Armament and Technical Products. Retrieved 7 April 2011. ^ a b c d e "F-35 Joint Strike Fighter Media Kit Statistics". JSF.mil August 2004. ^ a b Donald, David. "Terma Highlights F-35 Multi-Mission Pod". AINonline, 11 July 2012. ^ a b c d e f g h Davis, Brigadier General Charles R. "F-35 Program Brief". USAF, 26 September 2006. ^ "JSF Suite: BRU-67, BRU-68, LAU-147 – Carriage Systems: Pneumatic Actuated, Single Carriage". [dead link] es.is.itt.com, 2009. ^ a b Digger, Davis. "JSF Range & Airspace Requirements" Archived 19 December 2008 at the Wayback Machine. Headquarters Air Combat Command, Defense Technical Information Center, 30 October 2007. ^ a b Bolsøy, Bjørnar. "F-35 Lightning II status and future prospects". f-16.net, 17 September 2009. Retrieved 23 November 2009. ^ a b "£411 million investment in new missile for UK's new jets sustains 700 UK jobs". UK Ministry of Defence. 18 March 2016. ^ "Aimpoint selection: the UK's SPEAR Cap 3 air-to surface weapon" (PDF). IHS. 18 March 2016. ^ "F-35B STOVL Variant". Lockheed Martin. Retrieved 25 November 2010. ^ "Small Diameter Bomb II – GBU-53/B" Archived 27 February 2015 at the Wayback Machine. Defense Update. Retrieved 28 August 2010. ^ The U.S. Air Force & Raytheon Company (22 January 2013). "Raytheon, US Air Force complete Small Diameter Bomb II fit check on F-35 aircraft". marketwatch.com. PRNewswire. Archived from the original on 19 December 2013. Retrieved 24 May 2014. ^ a b Trimble, Stephen. "MBDA reveals clipped-fin Meteor for F-35". Archived 21 September 2010 at the Wayback Machine Flight International, 7 November 2010. ^ "F-35 Lightning II News: ASRAAM Config Change For F-35". f-16.net, 4 March 2008. ^ "Important cooperative agreement with Lockheed Martin". Kongsberg Defence & Aerospace, 9 June 2009. ^ Trimble, Stephen. "Raytheon gets DARPA boost for AMRAAM, HARM replacement". Archived 8 November 2010 at the Wayback Machine Flight International, 4 November 2010. ^ Reed, John. "Minuteman III Follow-On Being Eyed, Nukes for JSF Delayed". DoD Buzz, 6 April 2011. ^ Muradian, Vego. "The Future of the U.S. Nuclear Enterprise". Defense News, 14 October 2012. ^ Guarino, Douglas P. (16 January 2014). "Nuclear Security and Omnibus Legislation: What's Up and What's Down". nti.org. Global Security Newswire. Retrieved 16 January 2014. ^ Mehta, Aaron (17 January 2014). "Schwartz: Move away from nuclear F-35". militarytimes.com. Gannett Government Media. Archived from the original on 3 February 2014. Retrieved 17 January 2014. ^ Tirpak, John A. (17 March 2014). "Nuclear Lightning". airforcemag.com. Arlington, VA: Air Force Association. Archived from the original on 25 May 2014. Retrieved 24 May 2014. ^ Fulghum, David A. "Lasers being developed for F-35 and AC-130". Aviation Week and Space Technology, 8 July 2002. ^ Morris, Jefferson. "Keeping cool a big challenge for JSF laser, Lockheed Martin says". Aerospace Daily, 26 September 2002. ^ Fulghum, David A. "Lasers, HPM weapons near operational status". Aviation Week and Space Technology, 22 July 2002. ^ Norris, Guy (20 May 2013). "High-Speed Strike Weapon To Build On X-51 Flight". aviationweek.com. Aviation Week. Archived from the original on 20 May 2013. Retrieved 26 May 2013. ^ Browne, Ryan (9 April 2016). "Air Force looking to replace A-10 Warthog". cnn.com. CNN. Retrieved 9 April 2016. ^ "F-35 Joint Strike Fighter (JSF) Lightning II". GlobalSecurity.org. Retrieved 16 November 2010. ^ "USAF FY00 activity on the JSF". Archived 23 July 2011 at the Wayback Machine U.S. Director, Operational Test & Evaluation. Retrieved: 17 l 2012. ^ "F-35 Norwegian Executive Summary". Archived 12 October 2012 at the Wayback Machine Lockheed Martin, April 2008. ^ Hehs, Eric. "JSF Diverterless Supersonic Inlet". Code One Magazine. Retrieved 28 December 2012. ^ Capaccio, Tony. "Lockheed Martin’s F-35 Fighter Jet Passes Initial Stealth Hurdle". Bloomberg News, 4 May 2011. ^ "Threat Data Biggest Worry For F-35A's IOC; But It 'Will Be On Time'". Breaking Defense. Retrieved 31 March 2015. ^ Clark, Colin (6 June 2014). "Gen. Mike Hostage On The F-35; No Growlers Needed When War Starts". Breaking Defense. Retrieved 5 April 2019. ^ Ralston, J; Heagy, J; et al. "Environmental/Noise Effects on UHF/VHF UWB SAR". dtic.mil, September 1998. Retrieved: 2 January 2015. ^ Plopsky, Guy; Bozzato, Fabrizio (21 August 2014). "The F-35 vs. The VHF Threat". The Diplomat. ^ "F-35 – Beyond Stealth". Defense-Update.com. 14 June 2015. Retrieved 5 April 2019. ^ "Lockheed Martin wins $13 million contract for Strike Fighter aircraft from US Air Force". defenseworld.net. 22 November 2010. Retrieved 6 January 2014. ^ Brewer, Jeffrey; Meadows, Shawn (Summer 2006). "Survivability of the Next Strike Fighter". Aircraft Survivability: Susceptibility Reduction. Joint Aircraft Survivability Program Office. p. 23 – via dtic.mil. ^ a b Alaimo, Carol Ann. "Noisy F-35 Still Without A Home". Arizona Daily Star, 30 November 2008. Retrieved 23 November 2009. ^ Nicholson, Brendan (12 April 2011). "Noise triggers legal bid to down jet fighter". The Australian. ^ "Joint Communications Release, JSF Program Office & Lockheed Martin. Subject: F-35 Acoustics Based on Edwards AFB Acoustics, Test". JSF Program Office & Lockheed Martin, April 2009. Retrieved 15 January 2011. ^ Alaimo, Carol Ann. "Noisy F-35 could affect thousands, study finds". Arizona Daily Star, 13 June 2012. ^ Myers, Meghann (9 April 2014). "F-35 Forcing Navy To Develop New Hearing Protection For Flight Deck Crews". defensenews.com. Gannett Government Media. Archived from the original on 9 April 2014. Retrieved 9 April 2014. ^ "F-35Bs No Louder than F/A-18 Super Hornets". defensetech.org. 25 November 2014. ^ ""Lockheed Martin's F-35 Lightning II most advanced cockpit" at wordlesstech.com". wordlessTech. ^ Goebel, Greg. "The Lockheed Martin F-35 Joint Strike Fighter (JSF)". vectorsite.net. Archived from the original on 22 June 2012. Retrieved 23 November 2009. ^ Schutte, John (10 October 2007). "Researchers fine-tune F-35 pilot-aircraft speech system". af.mil. US Air Force. Archived from the original on 23 April 2016. ^ "Martin-Baker". Archived 21 October 2008 at the Wayback Machine JSF. Retrieved 23 November 2009. ^ Seligman, Lara (14 October 2015). "F-35's Heavier Helmet Complicates Ejection Risks". defensenews.com. TEGNA. Retrieved 15 October 2015. ^ Peladeau, Jean. "Pilots worry about F-35 oxygen system". QMI Agency, 11 May 2012. ^ Bennett, John T. "F-22's Oxygen Issues Raise Questions About F-35". Archived 25 May 2012 at the Wayback Machine US News, 24 May 2012. ^ "F-35 flight suspension at Luke AFB ends; cause of hypoxia not found". AZcentral.com. Retrieved 21 June 2017. ^ "VSI's Helmet Mounted Display System flies on Joint Strike Fighter". rockwellcollins.com. Rockwell Collins. 2007. Archived from the original on 17 August 2011. Retrieved 8 June 2008. ^ George, Eric (1 May 2010). "F-35 avionics: an interview with the Joint Strike Fighter's director of mission systems and software". Military & Aerospace Electronics (Interview). 21 (5). PennWell Corporation. Retrieved 27 November 2014. ^ "APG-81 (F-35 Lightning II)". northropgrumman.com. Northrop Grumman Electronic Systems. Archived from the original on 23 January 2013. Retrieved 4 August 2007. ^ Pappalardo, Joe. "How an F-35 Targets, Aims and Fires Without Being Seen". [dead link] Popular Mechanics, December 2009. Retrieved: 6 April 2010. ^ "Electronic Warfare: Australia's mixed record | Australian Defence News & Articles". Asia Pacific Defence Reporter. Archived from the original on 13 June 2013. Retrieved 24 February 2013. ^ "Electronic Warfare | Australian Defence News & Articles". Asia Pacific Defence Reporter. Archived from the original on 13 June 2013. Retrieved 24 February 2013. ^ "F-35 Distributed Aperture System (EO DAS)". northropgrumman.com. Northrop Grumman. Retrieved 6 April 2010. ^ "JSF EW Suite". Archived 18 September 2010 at the Wayback Machine istockanalyst.com. Retrieved 23 November 2009. ^ Tirpak, John A (October 2012). "Slow Climb for the F-35" (PDF). AIR FORCE Magazine. p. 42. Archived from the original (PDF) on 20 November 2012. Retrieved 3 October 2012. ^ Eshel, Noam (2 November 2010). "Distributed Aperture System Tracks Ballistic Missiles from 1,300 km Away". defense-update.com. Defense Update. Retrieved 18 December 2018. ^ "F-35 jet fighters to take integrated avionics to a whole new level". Military & Aerospace Electronics. PennWell Corporation. 1 May 2003. Retrieved 27 November 2014. ^ "Israel, US Negotiate $450 Million F-35I Avionic Enhancements" Archived 30 July 2012 at the Wayback Machine. Defense Update, 27 July 2012. ^ a b Sherman, Ron. "F-35 Electronic Warfare Suite: More Than Self-Protection". aviationtoday.com, 1 July 2006. Retrieved 22 August 2010. ^ Lyle, Amaani (6 March 2014). "Program executive officer describes F-35 progress". af.mil. American Forces Press Service. Retrieved 6 March 2014. ^ "Hey C and C++ Can Be Used In Safety Critical Applications Too!". Journal.thecsiac.com. 11 February 2001. Retrieved 24 February 2013. ^ a b McHale, John (1 February 2010). "F-35 Joint Strike Fighter leverages COTS for avionics systems". Military & Aerospace Electronics. PennWell Corporation. Retrieved 27 November 2014. ^ Reed, John. "Schwartz Concerned About F-35A Delays". DoD buzz, 23 November 2010. ^ Sweetman, Bill. "More F-35B Delays, Software Schedule At Risk". Aviation Week, 13 January 2011. ^ David A. Fulghum, Bill Sweetman, Bradley Perrett and Robert Wall. "Stealthy Chinese J-20 Vulnerable". Aviation Week, 14 January 2011. ^ "Tens of thousands of Xilinx FPGAs to be supplied by Lockheed Martin for F-35 Joint Strike Fighter avionics". ^ "F-35 Distributed Aperture System EO DAS". YouTube. Retrieved 23 November 2009. ^ "F-35 Helmet Display System To Scare the Bejeezus Out of Enemies". Gizmodo. ^ Davenport, Christian. "Meet the most fascinating part of the F-35: The $400,000 helmet". WashingtonPost.com. Retrieved 2 August 2015. 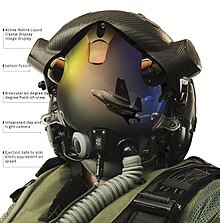 ^ "Lockheed Martin Selects BAE Systems to Supply F-35 Joint Strike Fighter (JSF) Helmet Display Solution". BAE Systems, 10 October 2011. ^ Szondy, David. "BAE Systems to provide new helmet display for F-35 pilots". Gizmag, 21 October 2011. ^ Carey, Bill. "BAE Drives Dual Approach To Fixing F-35 Helmet Display Issues". AINonline . 15 February 2012. ^ a b Majumdar, Dave (10 October 2013). "F-35 JPO drops development of BAE alternative helmet". flightglobal.com. Archived from the original on 29 April 2014. Retrieved 29 April 2014. ^ "Lockheed Martin Awards F-35 Contract". Zacks Investment Research, 17 November 2011. ^ Jean, Grace V. "New Sensor Aims to Give F-35 Pilots a ‘Window Into the Night’". Archived 21 July 2011 at the Wayback Machine National Defense Magazine, August 2011. ^ "Lockheed Cites Good Reports on Night Flights of F-35 Helmet". Reuters.com, 30 October 2012. ^ "U.S. Marines see progress in F-35 testing despite challenges". Reuters. 29 August 2013. ^ "Damning report on F-35's dogfighting problems – Business Insider". Business Insider. 2 July 2015. Retrieved 31 July 2015. ^ "F-35, Maintenance and the Challenge of Service Standardization" Archived 4 July 2011 at the Wayback Machine. Second Line of Defense, 9 June 2011. ^ Hawkins, Dan. "F-35 maintenance training spawns USMC's first air FTD". USMC, 27 July 2012. ^ Clark, Colin. "Why Lockheed Thinks F-35 Beats Boeing's F-18". Archived 7 November 2011 at the Wayback Machine Aol Defense, 3 November 2011. ^ "US Air Force praises early performance of Lockheed Martin F-35".Flightglobal.com, 6 November 2012. ^ Majumdar, Dave. "Stealth isn’t becoming obsolete anytime soon". Flight International, 30 November 2012. Retrieved 1 December 2012. ^ "FY 2014 Programs: F-35 Joint Strike Fighter (JSF)" (PDF). The Office of The Director, Operational Test And Evaluation (DOT&E). 15 January 2015. ^ "F-35 First Flight". [dead link] TeamJSF.com. Retrieved 10 October 2007. ^ Wolf, Jim. "F-35 fighter makes first vertical landing". Reuters, 18 March 2010. ^ Cavas, Christopher P. "F-35B STOVL fighter goes supersonic". Archived 14 July 2011 at the Wayback Machine Marine Corps Times, 15 June 2010. ^ Majumdar, Dave. "Lockheed says it’s fixed key F-35B issue". Defense News, 10 January 2011. ^ "Lockheed addresses Pentagon F-35 DOT&E report". Flight International. 18 January 2013. ^ Capaccio, Tony (21 February 2014). "Lockheed F-35 for Marines Delayed as Test Exposes Cracks". Bloomberg. Retrieved 21 February 2014. ^ Sweetman, Bill. "Get out and fly" Archived 18 August 2009 at the Wayback Machine. Defense Technology International, June 2009, pp. 43–44. ^ Capaccio, Tony. "Lockheed F-35 Purchases Delayed in Pentagon’s Fiscal 2011 Plan". Archived 10 January 2010 at the Wayback Machine Bloomberg BusinessWeek, 6 January 2010. ^ Bennett, John T. "Carter: More U.S. Programs To Get JET Treatment". defensenews.com, 29 March 2010. ^ Thompson, Loren B. "F-35 Cost Rise Is Speculative, But Progress Is Real". lexingtoninstitute.org, 12 March 2010. ^ "Senate Armed Services Committee Holds Hearing on President Obama's Fiscal 2011 Budget Request for the F-35 Joint Strike Fighter Program" Archived 9 May 2010 at the Wayback Machine. Congressional Record via startelegram.typepad.com, 11 March 2010. ^ Grant, Greg "JSF Production "Turned The Corner". dodbuzz.com. Retrieved 15 April 2010. ^ Rolfsen, Bruce. "Jobs to change with focus on irregular warfare". Army Times Publishing Company, 16 May 2010. ^ Warwick, Graham. "In-flight Failure Halts F-35 Flight Tests". Av Leak, 11 March 2011. ^ Cavas, Christopher P. "All F-35s Cleared To Resume Flight Tests". [dead link] DefenseNews, 25 March 2011. ^ Branch, Ricardo, Army Sgt. "Northern Edge fields new radar system". Archived 27 October 2013 at the Wayback Machine Northern Edge Joint Information Bureau, 8 March 2012. ^ Saiki, Lt. Col. Tracey. "Continued testing of F-35 JSF sensors a success at Northern Edge 2011". Af.mil. Retrieved 18 April 2012. ^ Trimble, Stephen. "F-35 fleet grounded after electrical subsystem failure". [dead link] Flight International, 3 August 2011. ^ Majumdar, Dave. "F-35s Grounded After Power Package Fails". Defense News, 3 August 2011. ^ "Statement on JPO Reinstituting Ground Operations for the F-35 Program". Joint Strike Fighter Program Office, 10 August 2011. ^ "F-35 Fleet Cleared For Ground Operations". Defense News, 10 August 2011. ^ Lerman, David. "Air Force Lifts Flight Ban on Lockheed F-35 Fighter Jet". Bloomberg News, 18 August 2011. ^ "Honeywell to test some F-35 parts after smoke incident". Reuters. ^ "F-35 JSF Flight Test Update". Defense Tech, 4 November 2011. ^ a b Norris, Guy. "F-35A pushes to Mach 1.6". Aviation Week & Space Technology, 9 December 2011. ^ "F-35B completes air start testing at Edwards AFB". Flight International, 4 September 2012. ^ Majumdar, Dave. "F-35C Tailhook Design Blamed for Landing Issues". Defense News, 17 January 2012. ^ Majumdar, Dave (12 December 2013). "Lockheed: New Carrier Hook for F-35". usni.org. U.S. NAVAL INSTITUTE. Retrieved 12 December 2013. ^ "F-35A releases first air-launched weapon". Flight International, 17 October 2012. ^ "F-35A Completes First AIM-120 Amraam Internal Weapons Release". Lockheed Martin press release, 22 October 2012. ^ "F-35C Lightning II Hits Weapons Testing Milestone". Globalsecurity.org, 30 November 2012. ^ "F-35A Completes First In-Flight Missile Launch". Lockheed Martin, 7 June 2013. ^ Majumdar, Dave. "MCAS Yuma receives(sic) first operational F-35B". Flight International, 17 November 2012. ^ "Marine Corps' first operational F-35B conducts initial Vertical Landing". Marines. U.S. Marine Corps. Retrieved 1 April 2018. ^ "F-35B Completes First Vertical Takeoff". Lockheed Martin, 20 May 2013. ^ "Naval fighter aircraft F-35B STOVL for U.S. Marine Corps completes 500th vertical landing". airrecognition.com. 7 August 2013. Archived from the original on 25 May 2014. Retrieved 24 May 2014. ^ Majumdar, Dave (18 January 2013). "F-35B grounded after fueldraulic line failure". flightglobal.com. Reed Business Information. Archived from the original on 25 May 2014. Retrieved 24 May 2014. ^ Hoffman, Michael (29 January 2013). "Pentagon: Crimped line caused F-35B grounding". dodbuzz.com. Archived from the original on 25 May 2014. Retrieved 24 May 2014. ^ "Engineers discover culprit behind F-35B fueldraulic line failure". Flight International. 28 January 2013. Retrieved 24 February 2013. ^ Mehta, Aaron (13 February 2013). "Pentagon clears F-35B to resume test flights". militarytimes.com. Image credit: Lockheed Martin. The Associated Press. Archived from the original on 25 May 2014. Retrieved 24 May 2014. ^ "F-35 fighter jet fleet grounded by Pentagon". BBC. 22 February 2013. Retrieved 23 February 2013. ^ Mount, Mike. "Military Clears F-35 Joint Strike Fighter to Fly" Archived 5 March 2016 at the Wayback Machine. CNN, 1 March 2013. ^ "F-35s cleared to resume flight operations". Flight International, 28 February 2013. ^ "F-35C Completes First Night Flight Aboard Aircraft Carrier". US Navy. 13 November 2014. Retrieved 28 November 2014. ^ "AF investigation: Catastrophic engine failure caused F-35 fire". Airforce News. 5 June 2015. Retrieved 5 June 2015. ^ Majumdar, Dave; Kjelgaard, Chris (27 March 2015). "F-35 Needs a Bigger, More Powerful Engine". The National Interest. Retrieved 29 July 2016. ^ "'F-35 Tests British Paveway IV Bomb'". Aviation Week. 19 June 2015. Retrieved 24 June 2015. ^ Tony Capaccio; Julie Johnsson; Bloomberg News (31 July 2015). "Better five years late than never: U.S. Marines finally ready to declare F-35B ready for limited combat duty". National Post. Retrieved 31 July 2015. ^ Christian Davenport (15 September 2015). "Pentagon weapons tester calls F-35 evaluation into question". Washington Post. Retrieved 29 September 2015. ^ "Netherlands Tanker Cleared To Refuel F-35". Aviation Week. 11 April 2016. ^ "Israel Declares F-35I Adir Combat Capable – F-35 Lightning II". F-35 Lightning II. Retrieved 9 December 2017. ^ "U.S. Senators Press Panetta to Review F-35 Training Safety". Archived 13 January 2012 at the Wayback Machine Bloomberg News, 9 December 2011. ^ Capaccio, Tony. "Air Force Expands F-35 Trials Over Tester’s Objections". Bloomberg BusinessWeek, 28 September 2012. ^ "Air Force issues flight release for Eglin AFB F-35A". af.mil. US Air Force. 28 February 2012. Archived from the original on 2 August 2013. Retrieved 5 May 2012. ^ Majumdar, Dave. "First Air National Guard pilot starts transition to F-35". Flight Magazine, 17 July 2012. ^ "Eglin F-35s fly 200th sortie". Flight International, 24 August 2012. ^ "Pentagon's Testing Czar Questions F-35 Program's OTE Plan". Archived 31 August 2012 at the Wayback Machine Aol Defense, 28 August 2012. ^ Shalal-Esa, Andrea. "More problems raised at Pentagon F-35 fighter review". Reuters, 10 September 2012. ^ Majumdar, Dave. "USAF to start F-35 operational utility evaluation on 10 September". Flight International, 7 September 2012. ^ Majumdar, Dave. "F-35 operational utility evaluation proceeding smoothly". Flightglobal.com, 1 October 2012. ^ Majumdar, Dave (16 November 2012). "USAF unit completes F-35 OUE activity". flightglobal.com. Image Credit: Lockheed Martin. Reed Business Information. Archived from the original on 25 May 2014. Retrieved 24 May 2014. ^ Majumdar, Dave. "Simulation plays vital role in building F-35 tactics and aircraft development". Flight International, 21 November 2012. ^ Majumdar, Dave. "US Air Force praises early performance of Lockheed Martin F-35". Flight International, 6 November 2012. 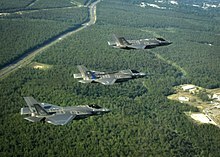 ^ "F-35 pilot training starts next month at Eglin>" Militarytimes.com, 17 December 2012. ^ a b Hennigan, William J. (26 June 2014). "U.S. military grounds all F-35 jets after fire at Florida base". The Los Angeles Times. Retrieved 2 July 2014. ^ a b Hennigan, William J. (24 June 2014). "F-35 fighter jets to resume flights after fire led to grounding". The Los Angeles Times. Retrieved 2 July 2014. ^ a b Butler, Amy. "Blade 'Rubbing' At Root of F-35A Engine Fire". Aviation Week. Penton Media. Retrieved 14 July 2014. ^ a b Mehta, Aaron (15 July 2014). "BREAKING: F-35 Cleared For Flight". defensenews.com. Defense News. Archived from the original on 17 July 2014. Retrieved 15 July 2014. ^ Clark, Colin (15 July 2014). "NO F-35s Coming To Farnborough; Safety First, Says SecDef Hagel". breakingdefense.com. Breaking Media, Inc. Retrieved 15 July 2014. ^ "The F-35 slaughtered the competition in its latest test". businessinsider.com. Retrieved 22 February 2017. ^ a b c d e Daniel, Lisa. "Plan Improves Navy, Marine Corps Air Capabilities". Archived 29 May 2011 at the Wayback Machine American Forces Press Service, 14 March 2011. ^ a b c Cavas, Christopher P. "More Marines to fly carrier-variant JSFs". Archived 28 April 2011 at the Wayback Machine Marine Corps Times, 14 March 2011. ^ Allen, Capt. Dyana. "Feature – VTANG first Air Guard Base to receive F-35A". af.mil. Archived from the original on 19 January 2016. Retrieved 24 November 2016. ^ "First of 144 F-35A Lightning II Stealth Jets Arrives at Luke AFB". deagel.com. 11 March 2014. Archived from the original on 25 May 2014. Retrieved 24 May 2014. ^ U.S. Air Force (11 March 2014). "First F-35 Lightning II arrives at Luke AFB > U.S. Air Force > Article Display". af.mil. Image credits: U.S. Air Force photo/Jim Hazeltine, 2xU.S. Air Force photo/Staff Sgt. Darlene Seltmann. Archived from the original on 25 May 2014. Retrieved 24 May 2014. ^ "RAF Lakenheath was selected as the first base to host USAFE F-35s". The Aviationist, Retrieved 13 January 2015. ^ "Israel says it is the first country to use U.S.-made F-35 in combat".. Reuters, 22 May 2018. ^ Everything We Know (And Don’t Know) About Israel Launching World’s First Air Strikes Using The F-35 Stealth Aircraft The Aviationist, 22 May 2018. ^ "F-35 jet used by U.S. in combat for first time". yahoo.com. Retrieved 27 September 2018. ^ "F-35 Joint Strike Fighter (JSF) Lightning II – International Partners". Global Security. Retrieved 7 April 2010. ^ Merle, Renae. "GAO Questions Cost Of Joint Strike Fighter". The Washington Post, 15 March 2005. ^ "Estimated JSF Air Vehicle Procurement Quantities". JSF.mil, Updated as of April 2010. ^ Tae-hoon, Lee. "Seoul fears delivery delays of F-35 jets". The Korea Times, 6 March 2012. ^ "F-35 Lightning: The Joint Strike Fighter Program, 2012". Defense Industry Daily, 30 October 2012. ^ "JSF Global Partners". Archived 4 October 2007 at the Wayback Machine teamjsf.com. Retrieved 30 March 2007. ^ Schnasi, Katherine V. "Joint Strike Fighter Acquisition: Observations on the Supplier Base". US Accounts Office. Retrieved 8 February 2006. ^ "Industry Canada F-35 Joint Strike Fighter (JSF) Canada's Next Generation Fighter Capability". Archived 22 September 2010 at the Wayback Machine ic.gc.ca. Retrieved 25 November 2010. ^ Editorial, Reuters. "Singapore 'seriously evaluating' future F-35 jet purchase -..." U.S. Retrieved 28 June 2018. ^ hermesauto (30 June 2018). "Decision on F-16 fighter jet replacement likely in next few months: Ng Eng Hen". The Straits Times. Retrieved 30 June 2018. ^ "US Lockheed Martin F-35 chosen as Japan fighter jet". BBC News, 20 December 2011. Retrieved: 20 December 2011. ^ "Update 1-Turkey keeps plan to buy 100 F-35 fighter jets". Reuters, 23 February 2012. ^ "Turkey plans to buy 100 F-35 jet fighters". Archived 21 May 2012 at the Wayback Machine turkishpress.com, 24 February 2012. ^ "Turkey to Buy Two Planes in Second F-35 Shipment". Archived 19 December 2013 at the Wayback Machine turkishweekly.net, 4 September 2012. ^ Harper, Tim. "Tim Harper: The Conservatives and their F-35 fairy tale". Toronto Star, 14 February 2012. ^ Vasarri, Chiara. "Italy to Cut F-35 Fighter Jet Orders as Part of Defense Revamp". Bloomberg Business Week, 14 February 2012. ^ Postmedia News. "A timeline on Canada's involvement in the F-35 program". Archived 10 April 2012 at the Wayback Machine Canada.com, 5 April 2012. ^ "Video: MPs hold Mackay to account in F-35 scandal" Archived 6 April 2012 at the Wayback Machine. The Canadian Press via The Globe and Mail, 4 April 2012. ^ Coyne, Andrew. "Peeling back the layers of misconduct in the F-35 fiasco". Archived 4 January 2013 at Archive.today National Post, 4 April 2012. ^ "The F-35 Fiasco". CBC News, 5 April 2012. ^ Stewart, Brian. "Super-costly F-35s, a global wrecking ball". Canadian Broadcasting Corporation, 13 December 2012. ^ "Canada cancels F-35 procurement". aviationweek.com. Retrieved 22 March 2018. ^ "UK Confirms First F-35 Orders". DefenseNews. 24 November 2014. Archived from the original on 26 November 2014. Retrieved 28 November 2014. ^ Manson, Katrina; Pitel, Laura. "US Senate blocks F-35 sales to Turkey". ft.com. Financial Times. Retrieved 19 June 2018. ^ "Singapore identifies F-35 fighter jet to replace F-16s, expects to buy 'small number' for full testing". Channel NewsAsia. Retrieved 18 January 2019. ^ Pike, John. "F-35A Joint Strike Fighter". Globalsecurity.org. Retrieved 23 November 2009. ^ "Flying The F-35: An Interview With Jon Beesley, F-35 Chief Test Pilot" Archived 18 December 2014 at the Wayback Machine. lockheedmartin.com. Retrieved 25 November 2010. ^ Hebert, Adam J. "Lightning II: So Far, So Good". Archived 21 February 2009 at the Wayback Machine airforce-magazine.com, Air Force Association, Volume 90, Issue 7, July 2007. Retrieved 3 December 2008. ^ Laurenzo, Ron. "Air Force: No Plan To Retire A-10". GlobalSecurity.org, Defense Weekly, 9 June 2003. Retrieved 3 December 2008. ^ Waldron, Greg. "IN FOCUS: Tokyo casts wary eye on Chinese airpower developments". Flight International, 2 August 2012. ^ "F-35s face communication problems in Arctic". The Canadian Press, 23 October 2011. ^ Ewing, Philip. "Lockheed’s comprehensive Q&A on the F-35". DoD Buzz, 19 June 2012. ^ "First Royal Netherlands Air Force F-35 Pilot Takes Flight". defensemedianetwork.com. Retrieved 21 January 2014. ^ a b "Cold Stops". ^ "F-35A Lightning II declared combat ready by Air Force". Military Embedded Systems. 2 August 2016. ^ "Air Force Declares F-35A Ready for Combat". Defense News. 2 August 2016. ^ Jennings, Gareth (13 July 2017). "UK to decide on future variants at 'appropriate time'". Janes Defence Weekly. Archived from the original on 18 July 2017. Retrieved 20 July 2017. ^ Haynes, Deborah (24 June 2017). "RAF set to scale back on F35 Supersonic Jets For Royal Navy Aircraft Carriers". The Times. Retrieved 24 June 2017. ^ Hancock, Ben D. "The STOVL Joint Strike Fighter in Support of the 21st Century Marine Corps". USMC, 1997. ^ Bly, Peter (14 June 2011). "Constructability of a High Temperature Concrete Pad" (PDF). usace-isc.org. Geotechnical & Structures Laboratory US Army Engineer Research & Development Center (ERDC). Archived from the original (PDF) on 25 April 2012. Retrieved 15 April 2014. ^ Sweetman, Bill. "Numbers Crunch: True cost of JSF program remains to be seen" Archived 4 March 2009 at the Wayback Machine. Defense Technology International, February 2009, p. 22. ^ "F-35 HMDS Pulls the Gs". Defense Industry Daily, 25 October 2007. ^ Alison, George (24 June 2015). "'F-35B successfully performs first launch from ski-jump'". UK Defense Journal. Retrieved 24 June 2015. ^ "F-35B STOVL-mode Flight". defenceaviation.com. Retrieved 25 November 2010. ^ Kerr, Julian (26 May 2014). "Australia could buy F-35B". IHS Jane's Defence Weekly. Archived from the original on 2 June 2014. Retrieved 8 June 2014. ^ Butterly, Nick (17 May 2014). "Jump jets on Defence radar". The West Australian. Yahoo7 News. Retrieved 8 June 2014. ^ George, Steve (20 June 2014). "LHD and STOVL: an engineer's view". The Strategist – The Australian Strategic Policy Institute Blog. Australian Strategic Policy Institute. Retrieved 28 November 2014. ^ Seidel, Jamie (19 November 2014). "Australian Strategic Policy Institute raises doubts over Abbott Government plan to rebuild newest warships". News.com.au. Retrieved 28 November 2014. ^ Brabin-Smith, Richard; Schreer, Benjamin (17 November 2014). "Jump jets for the ADF?". Strategic Insights. Australian Strategic Policy Institute (78). Retrieved 28 November 2014. ^ "Johnston raises possibility of acquiring F-35Bs". Australian Aviation. 19 May 2014. Retrieved 8 June 2014. ^ "Australia Abandons Proposal To Order F35B – Defense content from Aviation Week". aviationweek.com. Retrieved 31 July 2015. ^ "PM's floating fighter jet plan quietly sunk by Defence". Financial Review. Retrieved 31 July 2015. ^ "F-35B on Italian "Cavour" aircraft carrier". Military-today.com, 4 December 2011. ^ "US Marines eye UK JSF shipborne technique". [dead link] Flight International, 15 June 2007. ^ "Royal Air Force's No. 617 Squadron to fly F-35B fighter". Airforce Technology. 19 July 2013. Retrieved 23 July 2013. ^ "Dambusters to be first Lightning II squadron". 18 July 2013. Retrieved 23 July 2013. ^ "Immortal air squadron to fly Royal Navy's newest jets- Royal Navy". mod.uk. Retrieved 21 March 2015. ^ "Third Joint Strike Fighter for the UK arrives". RAF. 28 June 2013. Archived from the original on 1 July 2013. Retrieved 2 August 2013. ^ "F-35B Lightning II". RAF. 26 April 2013. Retrieved 30 May 2013. ^ "UK announces F-35B basing | Australian Aviation Magazine". Australianaviation.com.au. 26 March 2013. Retrieved 31 May 2013. ^ "Navy's new F-35 jump jet flies from trademark ski ramp for first time". Royal Navy. 25 June 2015. Retrieved 6 July 2015. ^ "Military Aircraft:Written question – 60456". UK Parliament. Retrieved 4 July 2017. ^ "Identity of F-35 Lightning Training Squadron Announced". Royal Air Force. 5 July 2017. Archived from the original on 28 July 2017. Retrieved 8 April 2019. ^ "RAF's legendary Dambusters squadron reforms to fly F-35 jets". gov.uk. Ministry of Defence. 18 April 2018. Retrieved 8 April 2019. ^ "Britain's most advanced jets touch down on home soil". gov.uk. Ministry of Defence. 6 June 2018. Retrieved 8 April 2019. ^ a b c "Further five F-35 fighter jets land at new RAF Marham home". ITN News. Retrieved 4 August 2018. ^ Nicholls, Dominic (10 January 2019). "New RAF jet 'combat ready' in face of resurgent Russia threat". The Telegraph. London. Retrieved 8 April 2019. ^ "UK's most advanced jets deploy overseas for the first time". gov.uk. Ministry of Defence. 8 April 2019. Retrieved 8 April 2019. ^ Gady, Franz-Stefan. "Finally! U.S. Marine Corps Declares F-35B Operational". thediplomat.com. James Pach. Retrieved 3 March 2018. ^ Trimble, Stephen (21 July 2008). "US Marine Corps aviation branch plans to invest in fighter jets, helicopters, transports and UAVs". Flight International. Reed Business Information. Archived from the original on 16 April 2014. Retrieved 15 April 2014. ^ Sweetman, Bill (11 March 2010). "About That Austere-Base Thing..." aviationweek.com. Archived from the original on 16 April 2014. Retrieved 15 April 2014. ^ Diamant, Aaron. "JSF construction lands another first". USMC, 22 December 2011. ^ Majumdar, Dave. "U.S. Military May Deploy F-35 Before Formal IOC". Defense News, 24 May 2011. ^ Majumdar, Dave. "USAF: F-35B cannot generate enough sorties to replace A-10". Flight Magazine, 16 May 2012. ^ Pew, Glenn. "Pentagon May Cancel STOVL Version of F-35". AvWeb, January 2011. ^ Ewing, Philip. "Lockheed: Many F-35B landings won’t be vertical". DoD Buzz, 7 June 2011. ^ Capaccio, Anthony (17 September 2013). "F-35 Fighter's Tires Wear Out Too Soon, Pentagon Finds". Bloomberg L.P.
^ "Simulations Offer Marines Advanced F-35B Weapons, Training". Archived from the original on 22 October 2013. ^ Trimble, Stephen. "VIDEO: F-35B completes first shipboard vertical landing". The DEWline, 4 October 2011. ^ Butler, Amy (8 April 2015). "U.S. Marines Prep for F-35B Ops Trials on USS Wasp". Aviation Week & Space Technology. Retrieved 9 April 2015. ^ Marshall, Tyrone. "Panetta Lifts F-35 Fighter Variant Probation". archive.defense.gov. U.S. Department of Defense. Retrieved 3 March 2018. ^ Butler, Amy (5 September 2013). "F-35B DT 2 Update: A few hours on the USS Wasp". Aviation Week & Space Technology. Archived from the original on 3 September 2014. Retrieved 4 April 2015. ^ Kovach, Gretel C. "Commandant calls Joint Strike Fighter essential". U-T San Diego, 8 December 2010. ^ Jean, Grace V. (September 2008). "Marines Question the Utility of Their New Amphibious Warship". nationaldefensemagazine.org. National Defense Industrial Association. Archived from the original on 6 December 2010. ^ "Marines Receive First F-35C". usni.org. 28 January 2015. Retrieved 23 March 2019. ^ "F-35C Carrier Variant Joint Strike Fighter (JSF)". GlobalSecurity.org. Retrieved 16 June 2010. ^ "F-35 Navy Version Undergoes Successful Design Review, Readies for Production". Lockheed Martin, 7 June 2007. Retrieved 16 June 2010. ^ Grant, Rebecca L., PhD "Navy Speeds Up F-35". Lexington Institute, 14 September 2009. Retrieved 20 September 2009. ^ "F-35C Lightning II rolled out". Archived 31 July 2009 at the Wayback Machine FrontierIndia.net, 29 July 2009. ^ "Document: 2015 U.S. Marine Corps Aviation Plan". USNI News. ^ Cavas, Christopher P. "U.S. Navy JSFs Resume Flight Ops After Glitch". Defense News, 24 June 2011. ^ "F-35C completes jet blast deflector testing". Archived 18 December 2014 at the Wayback Machine NAVAIR, 22 August 2011. Retrieved 23 August 2011. ^ Ewing, Philip. "The future is here: EMALS launches F-35". DODbuzz.com, 28 November 2011. ^ Cavas, Christopher P. (22 June 2013). "US Navy Fleet Squadron receives 1st F-35C JSF". intercepts.defensenews.com. Archived from the original on 13 March 2014. Retrieved 13 March 2014. ^ Commander, Naval Air Forces Public Affairs (22 June 2013). "Navy Receives First F-35C Lightning II". navy.mil (Press release). Archived from the original on 13 March 2014. Retrieved 13 March 2014. ^ Majumdar, Dave. "US Navy works through F-35C air-ship integration issues". Flight International, 1 October 2012. ^ "JSF Engine too big for regular transport at sea". Navy Times, 30 November 2010. ^ "F-35C Completes First Arrested Landing aboard Aircraft Carrier". Naval Air Forces, Public Affairs. US Navy. ^ "U.S. Navy Version of F-35 Lands on Carrier for First Time". USNI News. ^ "F-35C Completes Initial Sea Trials aboard Aircraft Carrier". Naval Air Forces, Public Affairs. US Navy. 17 November 2014. Retrieved 4 December 2014. ^ Farley, Robert (3 January 2014). "UAVs and the F-35: Partners in Air Power?". thediplomat.com. Image Credit: Wikimedia Commons. Archived from the original on 25 May 2014. Retrieved 24 May 2014. ^ Jennings, Gareth (26 January 2017). "USN stands up F-35C West Coast Fleet Replacement Squadron". IHS Jane's Navy International. London. Retrieved 11 May 2017 – via janes.com. ^ "Jet's name is just plane 'Awesome'". The Times of Israel. 18 April 2013. ^ "Israel's first F-35 Lightning II takes flight". Lockheed Martin. 26 July 2016. ^ Trimble, Stephen. "Israel sets sights on two-seater F-35". Flight International, 22 January 2010. ^ Egozi, Arie. "Israel to boost range of future F-35 fleet". Flight International. 11 January 2008. ^ "Israel, U.S. Agree To $450 Million In F-35 EW Work". Archived 10 May 2013 at the Wayback Machine Aviation Week, 6 August 2012. ^ Egozi, Arie (20 August 2013). "IAI aims to complete F-35 wing facility in mid-2014". flightglobal.com. Reed Business Information. Archived from the original on 25 May 2014. Retrieved 24 May 2014. ^ "Israel readies for 'super-tech' F-35 stealth fighterjets". timesofisrael.com. Retrieved 13 December 2016. ^ "Israel receives F-35s, first country after USA". ynetnews.com. Retrieved 13 December 2016. ^ "Israel to buy an additional 17 F-35 fighter planes". timesofisrael.com. Retrieved 13 December 2016. ^ Kubovich, Yaniv (22 May 2018). "Israel Is First Country in World to Carry Out 'Operational Attack' With the F-35 Stealth Fighter, Air Force Chief Says". Haaretz. ^ Daly, Brian (1 September 2010). "Harper, Ignatieff spar over fighter jets". Calgary Sun. Archived from the original on 2 March 2014. Retrieved 2 March 2014. ^ Berthiaume, Lee (20 December 2012). "Military will contract out air-to-air refuelling if Canada goes with F-35". o.canada.com. Archived from the original on 2 March 2014. Retrieved 2 March 2014. ^ Yalkin, Tolga R; Weltman, Peter (10 March 2011). "An Estimate of the Fiscal Impact of Canada's Proposed Acquisition of the F-35 Lightning II Joint Strike Fighter" (PDF). Office of the Parliamentary Budget Office. Archived (PDF) from the original on 2 March 2014. Retrieved 2 March 2014. ^ Liberal Party of Canada (5 October 2015). "A New Plan For a Strong Middle Class" (PDF). Archived from the original (PDF) on 14 October 2015. Retrieved 5 October 2015. ^ Drew, James (21 October 2015). "Canadian F-35 exit could signal wider air force review". Flight Global. Retrieved 6 November 2015. ^ "AF releases Future Operating Concept". af.mil. Secretary of the Air Force Public Affairs Command Information. 15 September 2015. Retrieved 27 September 2015. ^ Eaglen, Mackenzie; Berger, Rick (15 September 2015). "20 technologies that will keep the US Air Force flying high". aei.org. AEI. Retrieved 25 September 2015. ^ Defence, Department of (22 October 2018). "Australia takes delivery of 10th Joint Strike Fighter". minister.defence.gov.au. ^ Payne, Jacqui (20 September 2018). "3SQN takes command of its first F-35A". Air Force News. Royal Australian Air Force. p. 7. Retrieved 8 October 2018. ^ "Next_Three_F35A_Joint_Strike_Fighters_Mission_Ready – Capability Acquisition and Sustainment". defence.gov.au. ^ "The Australians Building Their Fifth Generation Air Force: The Latest Addition to the RAAF's F-35 Fleet". 25 September 2018. ^ Seidel, Jamie (10 December 2018). "Australia's first F-35 strike fighters have landed. But amid the fanfare, doubts linger over its ability to perform under pressure". News Corp Australia Network. ^ Emmott, Robin (25 October 2018). "Belgium picks Lockheed's F-35 over Eurofighter on price". Reuters. Brussels. Archived from the original on 25 October 2018. Retrieved 26 October 2018. ^ Insinna, Valerie (25 October 2018). "F-35 officially wins Belgian fighter contest". Defense News. Washington. Archived from the original on 25 October 2018. Retrieved 26 October 2018. ^ "Agreement on Procurement for New Fighters" (PDF). fmn.dk (in Danish). Ministry of Defence. Retrieved 9 June 2016. ^ a b Ahronheim, Anna (26 November 2018). "Air Force Bolsters Stealth Power as More F-35I Fighter Jets Land in Israel". Jerusalem Post – via jpost.com. ^ AirForces Monthly. Stamford, Lincolnshire, England: Key Publishing Ltd. March 2016. p. 23. ^ Tomkins, Richard (28 August 2017). "Israel finalizes deal for additional F-35 stealth fighters". United Press International. Archived from the original on 29 August 2017. Retrieved 29 August 2017. ^ Gross, Judah Ari (27 August 2017). "Israel finalizes agreements to buy 17 more F-35 jets". The Times of Israel. Archived from the original on 29 August 2017. Retrieved 29 August 2017. ^ "Italian MoD takes delivery of first non-US built F-35B – Jane's 360". janes.com. Archived from the original on 17 August 2018. Retrieved 28 September 2018. ^ Corte Dei Conti – Sezioni Riunite In Sede Di Controllo – Relazione – Sul Rendiconto Generale Dello Stato – 2016 Comunicata corteconti.it. Retrieved 15 September 2017. ^ Barone, Marco (15 March 2019). "F-35: SEI VELIVOLI DEL 13° GRUPPO PER LA PRIMA VOLTA RISCHIERATI AD ISTRANA". AERONAUTICA MILITARE. Retrieved 6 April 2019. ^ Cenciotti, David (2 April 2019). "Here's What Three Italian F-35 Instructor Pilots With 62nd FS Have To Say About Their First Red Flag With The Lightning II". The Aviationist. Retrieved 6 April 2019. ^ Gady, Franz-Stefan (1 April 2019). "Japan Air Self Defense Force Stands Up First F-35A Lightning II Fighter Squadron". The Diplomat. ^ Diplomat, Franz-Stefan Gady, The. "Japan to Procure 25 More F-35A Stealth Fighters". The Diplomat. Retrieved 30 March 2018. ^ Kelly, Tim; Kubo, Nobuhiro (21 February 2018). "Exclusive: Japan to buy at least 20 more F-35A stealth fighters – sources". Reuters News Agency. Retrieved 21 February 2018. ^ a b c d e "World Air Forces 2014" (PDF). Flightglobal Insight. 2014. Archived from the original (PDF) on 1 February 2014. Retrieved 17 January 2014. ^ "Netherlands Orders Eight F-35s". aviationweek.com. Retrieved 25 May 2015. ^ "Defence spending to be stepped up, more tanks and F-35 jets". dutchnews.nl. Retrieved 15 December 2018. ^ "First operational F-35 for Netherlands rolled out - Jane's 360". janes.com. Retrieved 1 February 2019. ^ "First F-35 squadron for the RNLAF". defensie.nl. Archived from the original on 22 January 2015. Retrieved 14 January 2015. ^ "Northrop Grumman completes center fuselage for first Norwegian F-35 aircraft". F-35 Lightning II. Retrieved 31 March 2015. ^ Shan, Ridge (15 December 2015). "Norwegian F-35 flies for first time under Norwegian command". Luke Air Force Base. Retrieved 6 April 2019. ^ "332 skvadron blir F-35 skvadron". Norwegian Armed Forces (in Norwegian). 8 September 2015. Retrieved 6 April 2019. ^ "South Korea agrees to buy F-35s". Janes. 24 September 2014. Archived from the original on 16 July 2015. ^ "South Korea plans to buy 20 additional F-35 aircraft: report". Reuters. 20 December 2017. ^ "S. Korea's Air Force welcomes arrival of 2 F-35A stealth fighters: report". yonhap news agency. 29 March 2019. ^ Slade, Alexandria (24 July 2018). "Republic of Korea Air Force F-35A pilot takes first flight". 944th Fighter Wing. Retrieved 6 April 2019. ^ "Türk pilotlar F-35 uçuş eğitimine başladı". kokpit.aero (in Turkish). 2 July 2018. Archived from the original on 2 July 2018. Retrieved 2 July 2018. ^ "F-35 teslimat töreni başladı". kokpit.aero (in Turkish). 21 June 2018. Archived from the original on 21 June 2018. Retrieved 21 June 2018. ^ "Turkey to Order Four More F-35 Fighter Jets – F-35 Lightning II". f35.com. Retrieved 24 November 2016. ^ "Turkey to possibly buy 20 more F-35 fighters". xairforces.net. Retrieved 25 October 2015. ^ Karadeniz, Tulay (27 February 2014). "Turkey likely to order Lockheed F-35 fighters in 2015". Reuters. Editing by Stephen Powell; Additional reporting by Nobuhiro Kubo and Tim Kelly (Tokyo); Photo Credit: Reuters/Lockheed Martin/Randy A. Crites/Handout. London: Thomson Reuters. Archived from the original on 10 April 2014. Retrieved 10 April 2014. ^ BURAK EGE BEKDIL. "Turkey Orders First Two F-35s" DefenseNews, 7 May 2014. Accessed: 10 May 2014. ^ Reuters (28 October 2016). "Turkey Plans More F-35 Orders After Receiving First Batch in 2018". Retrieved 22 March 2018 – via Haaretz. ^ Rempfer, Ken (2 April 2019). "Turkish pilots will keep training on F-35s in Arizona, despite possibly being cut from the program". Air Force Times. Retrieved 6 April 2019. ^ a b c "Global: Participation: US | F-35 Lightning II". F35.com. Retrieved 30 April 2014. ^ "Factsheets : 33rd Fighter Wing". Eglin.af.mil. Archived from the original on 27 December 2010. Retrieved 30 April 2014. ^ Lockheed Martin. "F-35 Testing". Lockheed Martin. Retrieved 17 April 2017. ^ "About: Who's Flying: Nellis | F-35 Lightning II". F35.com. Retrieved 30 April 2014. ^ "Factsheets : 56TH OPERATIONS GROUP". Luke.af.mil. Archived from the original on 25 March 2014. Retrieved 30 April 2014. ^ "F-35 Mission Continues to Evolve". 56th Fighter Wing Public Affairs. Retrieved 16 April 2017. ^ "Luke activates 3rd F-35 Squadron". Airman 1st Class Ridge Shan. Retrieved 16 April 2017. ^ "Luke AFB stands up new F-35A lightning II fighter squadron". Airman 1st Class Aspen Reid. Retrieved 7 December 2018. ^ "Hill commemorates new era in combat air power". af.mil. Archived from the original on 27 October 2015. Retrieved 17 October 2015. ^ Laura Mowry. "461st FLTS gets new boss". Edwards.af.mil. Archived from the original on 2 May 2014. Retrieved 30 April 2014. ^ a b Italian AF, Navy Head for F-35B Showdown Archived 11 February 2015 at Archive.today, defensenews.com. Retrieved 10 February 2015. ^ "Primo test in arrivo per l'F-35 a decollo corto (made in Piemonte)". ilsole24ore.com. Retrieved 25 November 2017. ^ Harding, Robin (18 December 2018). "Japan to expand military with 100 more F-35 stealth fighters". FT. Retrieved 10 January 2019. ^ Farley, Robert (2 January 2018). "Who Wants to Operate Carrier-Based F-35Bs in Asia? Apparently, Japan and South Korea". the Diplomat. ^ "TCG Trakya, On The Way". en.c4defence.com. 22 May 2018. Archived from the original on 22 May 2018. Retrieved 22 May 2018. ^ "Lockheed Martin-Built F-35 Comes Home to RAF Marham". f35.com. Lockheed Martin. Retrieved 19 June 2018. ^ Defence Review: Fighting old battles?, BBC News. Retrieved 24 November 2015. ^ "National Security Strategy and Strategic Defence and Security Review 2015" (PDF). HM Government. 23 November 2015. Retrieved 24 November 2015. ^ "First F-35 jets ready to battle for Britain". ^ Stevenson, Beth (10 February 2015). "RAF's 17 Sqn assumes control of F-35 test and evaluation". Flight Global. Retrieved 31 May 2015. ^ a b c d e f "U.K. Planning Four Front-Line F-35 Squadrons". Aviationweek. 19 May 2016. Retrieved 19 May 2016. ^ a b "RAF F-35B PILOT EXPLAINS THE AIRCRAFT AND TRAINING". Royal Air Force. 22 February 2018. Retrieved 6 April 2019. ^ "Identity of F-35 Lightning Training Squadron Announced". RAF. 6 July 2017. Archived from the original on 28 July 2017. Retrieved 6 July 2017. ^ 'Immortal’ air squadron to fly Royal Navy’s newest jets, royalnavy.mod.uk. Retrieved 31 May 2015. ^ Hoyle, Craig (19 September 2017). "UK outlines IOC target for F-35s". FlightGlobal. Retrieved 6 April 2019. ^ Daniel, Lisa (14 March 2011). "Plan Improves Navy, Marine Corps Air Capabilities". American Forces Press Service. U.S. Department of Defense. Archived from the original on 29 May 2011. Retrieved 23 March 2011. ^ Cifuentes, Sgt Michael S. (14 March 2011). "Marine Corps continues flying with Joint Strike Fighter program". Headquarters Marine Corps. U.S. Marine Corps. Archived from the original on 25 March 2011. Retrieved 23 March 2011. ^ "VMX-22 receives first F-35B aircraft". USMC. Retrieved 20 April 2015. ^ "First F-35B Squadron Moves to Japan". Valerie Insinna. Retrieved 12 April 2017. ^ "Second F-35B Squadron Stands Up At Marine Corps Air Station Yuma". U.S. Naval Institute. Retrieved 1 July 2016. ^ "Warlords return to Fightertown". marines.mil. Retrieved 25 May 2015. ^ "VX-9 Det Edwards". US Navy. Retrieved 14 December 2016. ^ "F-35C Completes First Arrested Landing aboard Aircraft Carrier". Naval Air Forces, Public Affairs. US Navy. Retrieved 4 February 2015. ^ "Navy's VFA-101 Stands Up at Eglin – Defense Media Network". Defense Media Network. Retrieved 4 February 2015. ^ "First Pacific-based F-35C Fighters arrive at NAS Lemoore". ^ Faram, Mark D. (4 April 2018). "Navy fighter squadron begins switch to the F-35". Navy Times. ^ Shalal, Andrea (27 June 2014). "Engine pieces found on runway after F-35 fire – sources". Reuters.Com (US Edition). Thomson Reuters. Reuters. Retrieved 2 July 2014. ^ "Kendall: Fan-Blade Rubbing Cause of F-35 Fire". Defense News. Archived from the original on 6 August 2014. Retrieved 21 September 2014. ^ "F-35B Lightning II fighter jet crashes, pilot ejects in South Carolina". Stripes.com. Retrieved 28 September 2018. ^ Sonne, Paul (28 September 2018). "F-35 crashes for the first time in the jet's 17-year history, pilot ejects safely". The Washington Post. Retrieved 8 December 2018. ^ Macias, Amanda; Breuninger, Kevin. "Pentagon grounds Lockheed Martin's F-35 jets after South Carolina crash". CNBC. Retrieved 16 December 2018. ^ "Report: New Japanese F-35s made seven emergency landings leading up to crash in the Pacific". NEWSREP. 19 April 2019. Retrieved 20 April 2019. ^ "Japanese F-35A Disappears from Radar over Pacific". military.com. 9 April 2019. Retrieved 9 April 2019. ^ "Japan Finds Wreckage From F-35 Fighter Jet, but Pilot Is Still Missing". nytimes.com. 10 April 2019. Retrieved 10 April 2019. ^ a b "F-35 stealth fighter that crashed off Japan didn't send distress signal before Pacific plunge". The Japan Times. 11 April 2019. Retrieved 13 April 2019. ^ a b c Yeo, Mike (12 April 2019). "F-35A crash: Japan's defense minister addresses security concerns, procurement plans". Defense News. Retrieved 13 April 2019. ^ "Japanese F-35 fighter jet disappears over Pacific during exercise". Kyodo News. 10 April 2019. Retrieved 13 April 2019. ^ Kelly, Tim (11 April 2019). "Daunting salvage task awaits Japanese F-35 investigators baffled by crash". Reuters. Retrieved 13 April 2019. ^ "F-35B Short Takeoff/Vertical Landing Variant". lockheedmartin.com. Lockheed Martin. Archived from the original on 17 March 2011. Retrieved 13 July 2012. ^ "F-35C Carrier Variant". lockheedmartin.com. Lockheed Martin. Archived from the original on 17 March 2011. Retrieved 13 July 2012. ^ "F-35 Weaponry". f35.com. Lockheed Martin. Retrieved 28 February 2019. ^ "F-35 Lightning II Program Status and Fast Facts" (PDF). f-35.ca. Lockheed Martin. 13 March 2012. Archived from the original (PDF) on 24 May 2013. Retrieved 22 May 2012. ^ a b "F-35 > Variants". jsf.mil. F-35 Joint Strike Fighter Program. Retrieved 31 July 2015. ^ "F-35 Joint Strike Fighter (JSF): DOTE FY 2016 Annual Report" (PDF). ^ "F-35 variants". JSF. Retrieved 22 August 2010. ^ a b "The Pratt & Whitney F135". [permanent dead link] Jane's Aero Engines. Jane's Information Group, 2009. (subscription version, dated 10 July 2009). ^ "Lockheed Martin F-35 Lightning II". [permanent dead link] Jane's All the World's Aircraft. Jane's Information Group, 2010. (subscription article, dated 1 February 2010). ^ "F-35C Carrier Variant". lockheedmartin.com. Archived from the original on 11 May 2015. Retrieved 25 May 2015. ^ a b "FY2019 President's Budget Selected Acquisition Report (SAR) – F-35 Joint Strike Fighter Aircraft (F-35)". scribd.com. ^ North, Gary (April 2016). "Long Combat Radius" (PDF). F-35: The Future is Now. Retrieved 5 April 2019 – via fisher.org.il. ^ "F-35A Lightning II". af.mil. Retrieved 25 November 2017. ^ "ATK Awarded $55 Million Advanced Anti-Radiation Guided Missile Low Rate Initial Production". Reuters. 21 January 2009. Archived from the original on 23 June 2013. Retrieved 13 July 2011. ^ Ewing, Philip. "The Navy’s advanced weapons shopping list". Military.com, 3 July 2012. ^ "Nuclear Posture Review Report" (PDF). defense.gov. Washington, D.C.: US Department of Defense. April 2010. Archived from the original (PDF) on 7 December 2014. Retrieved 7 April 2010. ^ "ASQ242 Datasheet" (PDF). northropgrumman.com. Northrop Grumman. ^ "FY2016 DOT&E Report – F-35 Joint Strike Fighter Aircraft (F-35)" (PDF). dote.osd.mil. 2017. p. 15. Lake, Jon. "The West's Great Hope". AirForces Monthly, December 2010.